There is a pandemic of diabetes. More than 350 million people are affected world-wide. In the UK more than 4.2 million people (6.3% of the population) are estimated to be living with diabetes, many without even knowing it (1). In the USA 29.1 million (9.3% of the population) have diabetes (2). Most individuals have type-2 diabetes, the onset of which is nearly universally attributed to the adoption of a “western diet”, rich in calories from refined carbohydrates and saturated fat. But type 1 diabetes is also increasing. Furthermore, type 2 diabetes now appears at much earlier ages, even in children, and increasing numbers of people with type-2 are insulin dependent (3). Individuals are not only developing diabetes at earlier ages, but also living longer. There are now various ways of controlling diabetes, but sadly these are not as successful in treating the complications of diabetes that are related to the heart, major blood vessels, peripheral nerves, kidneys and the eye(4). With an estimated 150,000 people in the UK developing diabetes each year, the prevalence of very long standing diabetes is growing even more rapidly than the prevalence of diabetes itself. This sets up a ‘perfect storm’ for the complications of diabetes which develop after long periods. Diabetes literally means “a passer through; a siphon,” so named because of the immoderate discharge of urine containing glucose which is a cardinal feature of the disease. The word comes to English by way of the Latin (diabetes) from the Ancient Greek (διαβήτης [diabêtês]). The earliest meaning of the noun “diabetes” was “compass” (5th cent. B.C. ); it was not used in the sense of “siphon” (a passer through) until the 2nd or 1st cent. BC. 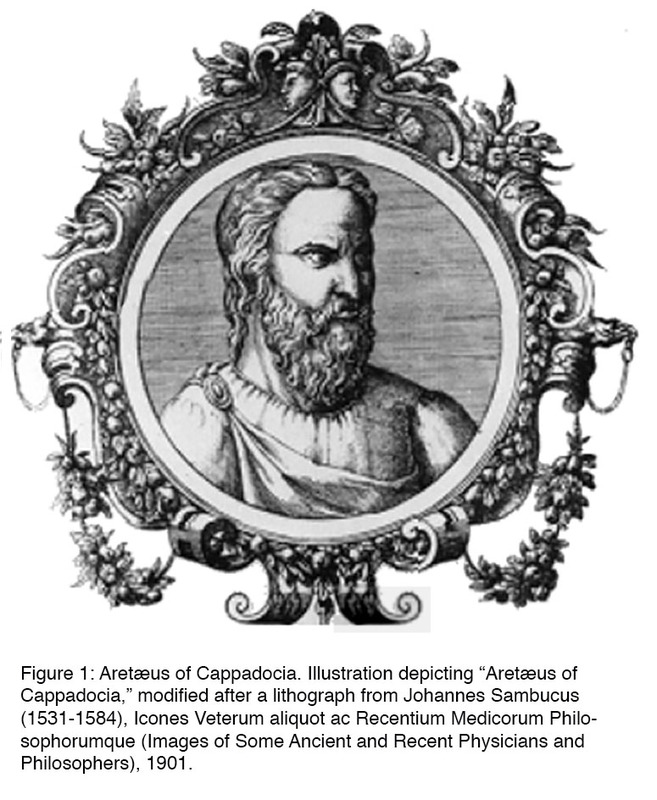 Its first attestation as the name of a disease is in the 2nd century A.D. by Aretaeus, a Cappadocian (Greek) physician and medical writer (Figure 1), and by his contemporary Galen. Figure 1: Aretæus of Cappadocia. Illustration depicting “Aretæus of Cappadocia,” modified after a lithograph from Johannes Sambucus (1531-1584), Icones Veterum aliquot ac Recentium Medicorum Philosophorumque (Images of Some Ancient and Recent Physicians and Philosophers), 1901. Diabetes can further be broadly divided into two classes of disorders, diabetes mellitus and diabetes insipidus. Both share in common the production of copious quantities of urine, as well as an associated risk of dehydration and electrolyte imbalances; however, the two diseases originate from very different sources. When the term “diabetes” is used without qualification, it almost always refers to diabetes mellitus. Diabetes mellitus is a group of severe metabolic disorders marked by high levels of blood glucose resulting from defects in the production of insulin, resistance to that action of insulin, or a combination both. Greek physicians used to diagnose the condition by tasting the urine to detect saccharine matter. In 1675, the English epidemiologist Thomas Willis (1621–1675) rediscovered this phenomenon and appended the term “mellitus,” meaning “honey-sweet,” to the name diabetes (6) (Allan FM, 1953). To some extent this diagnostic practice continued into the 20th century among physicians who were taught to use literally all of their senses in the art (and science) of diagnosis. Diabetes insipidus is a relatively rare disorder and glucose does not ordinarily spill into the urine of patients, hence the term “insipidus,” Latin for “tasteless,” appended to the name (6). There are two main forms of diabetes mellitus: type 1 and type 2. In years gone by, these were sometimes referred to as ‘Juvenile’ versus ‘Adult’ or ‘Insulin dependent’ versus non-insulin dependent’, but some type 1 cases develop in older age, and many type 2 cases are treated with insulin. Hyperglycemia is the hallmark of both forms of the disease, the result of a failure in insulin signaling. In type 1, diabetes results from diminished secretions of insulin because of a nearly complete loss of β cells of the islets of Langerhans due to autoimmune attack. In type 2 disease a number of defects conspire to reduce the effective secretion of insulin and its activity at its receptors in various tissues. Gestational diabetes mellitus (GDM) has been retained as a separate diagnosis category (7), and a new category called “other specific types” created to cover the growing number of cases where specific genetic defects, surgery, drugs, or other cause of hyperglycemia have been identified (8). Type 1 diabetes results from the near complete loss of insulin secretion from the pancreas. Its onset is usually acute and associated with increased output of urine, associated thirst, tiredness and weight loss (the ‘four T’s’ of toilet, thirst, tiredness, and thinner). For an unknown reason, autoantibodies are produced that destroy the insulin-producing β cells of the pancreatic islets. The loss of β cells may begin years before diabetes is detected, and in some cases children with type 1 disease have a short remission of symptoms during the early stages of the disorder; in rare instances a complete remission may even occur (9). There is a strong genetic risk for the disease associated with the major histocompatibility complex (MHC) genes, especially certain human leukocyte antigens (HLA) alleles, but genes outside of the MHC have also been associated with increased risk of the disease (10, 11). The mechanism by which heredity makes the β cells more susceptible to autoimmune attack remains obscure. Type 1 diabetes only accounts for five to ten per cent of all diabetic patients, but is the most common form of diabetes in children and adolescents. The prevalence is approximately one out of every 500 children and adolescents in the United States (12, 13), having risen more than thirty per cent within the last decade. The mean age of onset of type 1 diabetes is approximately 9 years of age and has been reported to occur at a slightly earlier age in girls (8.7±3.8 years) than in boys (9.1±4.1 years) (14). Recently, the incidence of type 1 disease is increasing in many populations (by as much as three to four per cent a year), a fact that cannot be explained by genetics alone (10). Although epidemiological studies have failed to identify a specific causal entity (15), space-time clustering of cases suggests that an infectious etiology is possible (16). In certain instances, a virus, again most likely by initiating the development of autoantibodies, may also induce type 1diabetes. Type 2 diabetes is by far the more prevalent from of the disease, accounting for roughly ninety to ninety-five per cent of diabetic patients in the United States (17). The onset of type 2 diabetes is usually in adulthood and occurs decades after elements of the ‘metabolic syndrome’ appear. Type 2 diabetes usually has an insidious onset, and patients are for the most part unaware of the onset until they suffer from acute side effects of extreme hyperglycemia, or another illness which leads to its discovery (for example, repeated infections). Diabetes UK has estimated that up to 25% of patients who consult their general practitioners for other reasons may have undetected type 2 diabetes, and recommend that all patients have tests for glycosylated hemoglobin levels (Hb1Ac). The hallmark of type 2 diabetes is insulin resistance, accompanied by variable defects in insulin secretion. In type 2 disease, insulin is usually present, but its activity is insufficient to meet the metabolic needs of the body. Initially, the β cells of the pancreas may be able to augment their secretion of insulin when faced with insulin resistance, but over time β cell output fails. This may result from either increasing insulin resistance, β cell exhaustion (degeneration), or both. Insufficient insulin activity causes patients to become “glucose intolerant”, i.e. experience abnormally elevated blood glucose levels following carbohydrate loads. Whereas nearly all patients with type 1 diabetes are aware that they have the disease because of the effects of severe insulin deficiency, roughly 6.2 million people in the United States with the type 2 disease are currently unaware that they have diabetes (3, 17). Often the onsets of symptoms are so gradual, or the effects of diabetes so mild or intermittent, that people with diabetes fail to recognize that they have a disorder of blood glucose regulation. However, if left untreated the consequences of diabetes are devastating. Together, these metabolic defects take their toll on the body, lead to a series of complications, and patients often succumb to an early death (15,18 ). Here we specifically concentrate on the damage that occurs at the level of the light-sensitive retina at the back of the eye. Already 240,000 people in the UK with diabetes have diabetic retinopathy. Visual impairment may occur from bleeding in the eye, often with accompanying abnormal proliferating blood vessels, retinal detachment from associated scar tissue, or even more commonly the leakage of fluid from damaged capillaries in the central part of the retina. This is called diabetic macular edema (DME). In the USA, DME is the leading cause of blindness in people of working age (3). In the UK although the prevalence is similar, there has been a recent increase in the incidence of hereditary retinal degeneration, so DME is now the second most common cause of registered blindness in the working age group (4). Once diabetes has damaged the retina, vision is often permanently lost. For this reason all efforts are being made to detect diabetic retinopathy (DR) as early as possible by taking photographs of the back of the eye (Figure 2) each year in every person who had diabetes. In the UK, for example, over 3 million people are examined in this way each year, and over 100,000 of these are referred to the eye departments of NHS Trusts, which are struggling to cope with these large numbers of patients. National eye screening programs using fundus photography and reading centers have been set up in many health care centers throughout the world. Figure 2: Fundus photograph of a person with mild (early) nonproliferative diabetic retinopathy with centre-involving diabetic macular edema (DME) in the left eye. The white arrow-heads highlight typical examples of small red “dot” (microaneurysms) and “blot” (hemorrhages). The black arrow points to retinal exudates several of which are within 500 microns of the centre of the fovea. The yellow circle delineates an area of central thickening of the retina (edema). Clinically, DR is divided into nonproliferative and proliferative disease, the latter of which is marked by evidence of new vessel formation. 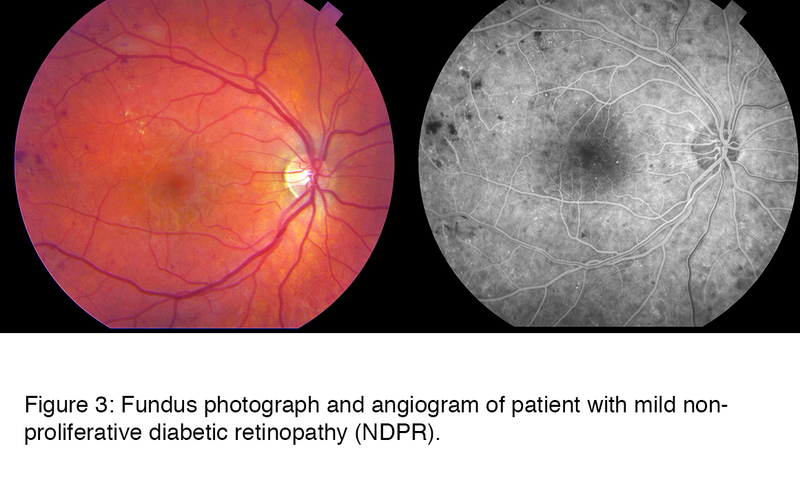 Non-proliferative diabetic retinopathy (NPDR) can further be divided into mild, moderate and severe, “pre-proliferative” diabetic retinopathy. The term “background retinopathy” is no longer used. As patients with sight-threatening retinopathy may not have symptoms, life-long evaluation for retinopathy by annual screening is a valuable and necessary strategy. 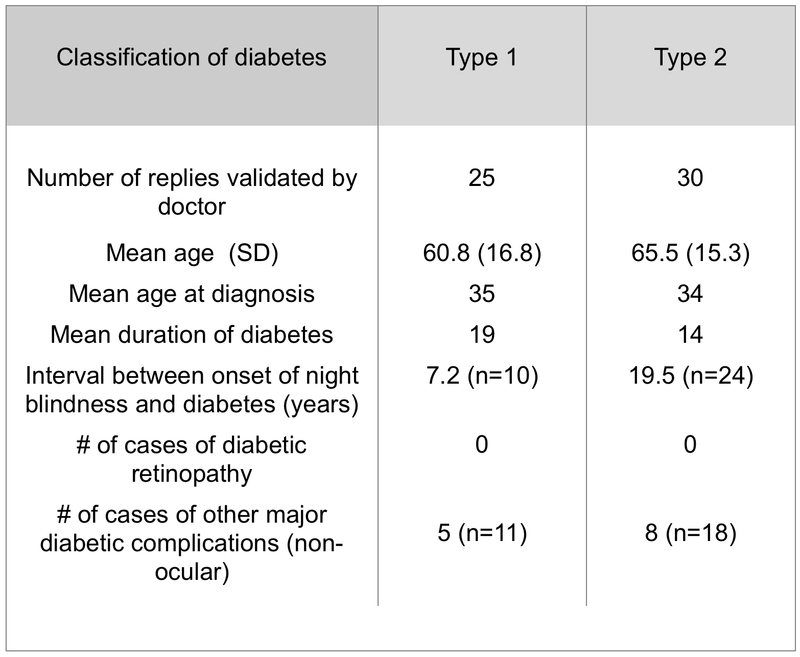 Pediatric patients with type 1 diabetes generally do not need to have a screening exam for retinopathy before age 9, or within 3 to 5 years of diagnosis, but should have them yearly thereafter (19). This is because DR generally does not start to develop until approximately five years after the onset of diabetes and is unusual before puberty; on average, only half of patients with type 1 diabetes develop retinopathy by eight to ten years after the onset of disease (20, 21). By contrast, because patients with type 2 disease may have had diabetes for ten or fifteen years prior to their diagnosis (22), it is essential that they are screened at baseline and yearly thereafter (23-25). Recent data from the Liverpool eye study suggest that a longer interval after an initial exam may be appropriate for type 2 patients. Type 2 patients without clinically detectible retinopathy at baseline remained free of sight-threatening DR for an average of 5.4 years (26). The complications develop insidiously often going unnoticed by patients until there is a sudden and dramatic loss of visual acuity caused for example by preretinal hemorrhages from new vessels or loss of central vision from retinal swelling. The fundus photographs (Figure 2) show small circular “dark lesions”, which are microaneurysms or “dot and blot” hemorrhages, or lighter exudates. Swelling of the macular retina is also detectable (for more details see (27)). Microaneurysms are thought to be due in part to loss of pericytes (27). In the resulting capillary dilatation, blood flow is sluggish and localised clotting may occur. In the end stages of this process the whole capillary is often obliterated. This can be seen histologically as ‘ghost vessels’ and on fluorescein angiography of the retinal circulation localized areas appear where the inner retinal capillary blood supply is lost. Dark-adapted thresholds are elevated early in diabetes (26, 28-31) and selective loss of blue–yellow colour contrast sensitivity occurs early in the disease (32-34). Clinical screening by slit lamp biomicroscopy and indirect ophthalmoscopy, complimented by fundus photography, and often optical coherence tomography (OCT) is necessary to monitor the disease in individuals. More recently, the advent of wide field and now ultra-wide field angiography have the potential to aid in the diagnosis and management of retinopathy (35, 36) but have not yet been incorporated into any screening programme. In animals, results similar to those in man can be seen, but there are species differences. Rodents develop microaneurysms (37) but these changes are much less pronounced than in man (38) and proliferative retinopathy is not seen or the later hemorrhagic changes seen in man. These do appear in longer-lived species such as dogs. Swelling of the retina can be seen in mouse, but it is not clear how closely related this is to human DME. The different stages of the disease are seen in the following series of retinal photographs. 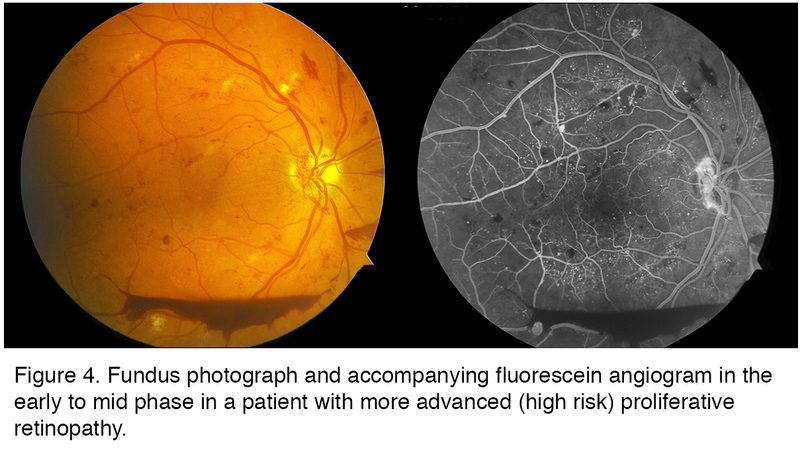 The progress of DR is most clearly seen in fluorescein angiographs where the damage to the retinal vessels and arterioles are more obvious than in the fundus photos. These studies also highlight regions of capillary dropout and other microvascular abnormalities. In man the earliest stages of the disease, loss of retinal capillary pericytes, contributes to mechanical changes in the retinal blood vessels, altering their patency and permeability (39). These changes consist of microaneurysms (i.e. focal dilations) of retinal capillaries located in the inner nuclear layer that can be appreciated by the direct ophthalmoscope as tiny red dots about the size of a pinhead in the retina. (Isolated microaneurysms also appear in a number of other retinal diseases, including glaucoma, hypertensive retinopathy, and venous occlusal diseases like central retinal vein obstruction). These vascular changes often progress to yield hemorrhages within the retina. Hemorrhages in early DR usually appear as either “dot/blot” or “flame” hemorrhages, however, severe retinal bleeding can occur. Dot hemorrhages (tiny) and blot hemorrhages (larger) are the result of the rupture of weakened capillaries (i.e. aneurysms) within the neural retina. Flame hemorrhages are the result of the same underlying process, but occur in the superficial layers of the retina causing the blood to track along nerve fiber bundles. Hard exudates, appreciable as yellow-white spots in the peripheral retina or sometimes in a pattern of streaks around the macula, also tend to increase in number. These precipitates consist of lipoproteins and other proteins that have been extravasated from leaky retinal blood vessels as a result of the failure of the blood retinal barrier (40). Finally, microretinal infarcts often occur in the nerve fiber layer of the retina to give rise to patches of dead retinal tissue with vague borders known as “cotton wool” spots—transient findings that are no longer considered as predictive of high risk disease as many of the other vascular features discussed below. 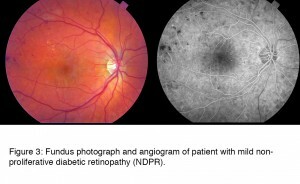 Figure 3: Fundus photograph and angiogram of patient with mild non-proliferative diabetic retinopathy (NDPR). The patient in Figure 3 has mild non-proliferative diabetic retinopathy (NDPR) and the fundus photograph at first blush looks almost normal. The changes clinically apparent are microaneurysms, some red spots of hemorrhage, and hard yellow exudates, and on close inspection early signs of ischemia. The damage to the retina in DR is most clearly seen in the angiographs where the damage to the retinal vessels and arterioles are more obvious than in the fundus photos. The fluorescein angiogram (right) shows the hemorrhages as dark spots. This photograph was taken as the dye began to fill the vessels, and a few bright spots indicate the presence of microaneurysms. In later frames of the angiogram (not shown) these cause leakage, which is one of the mechanisms by which retinal swelling is known to occur. Pre-proliferative retinopathy (PPDR) consists of a series of signs in the retinal vasculature that heralds the worsening retinal ischemia that can ultimately lead to formation of new vessels. Progression to the pre-proliferative stage of diabetic retinopathy is marked by 1: a rapid increase in the size and confluence of hemorrhages, 2: the appearance of >5 cotton-wool spots (ischemic nerve fiber layer infarcts), 3: venous dilation and beading (focal variation in the caliber of retina veins in response to ischemia), and 4: arterial abnormalities and remodeling of existing retinal capillary beds (causing intraretinal microvascular abnormalities that do not leak fluorescein). Of these clinical signs, venous beading is considered the most significant predictor of progression to proliferative diabetic retinopathy (PDR), whereas cotton-wool spots are the least significant (because they are so transient, lasting often only a few days to a couple of weeks). About half of eyes with these retinal characteristics progress to PDR within 12 to 24 months, indicating a strong need for careful monitoring at this stage. Unfortunately, no preventative or restorative treatment exists for PPDR, although anti-VEGF agents have shown some promise in clinical trials in patients with concurrent DME (41). The hallmark of proliferative diabetic retinopathy (PDR) is neovascularization of the retina at the edges of zones of capillary non-perfusion, most often near the optic disc or within three disc diameters of major retinal vessels (42). The new blood vessels that form around the optic nerve head are referred to as “new vessel disc” (NVD) and other vessels are clinically termed “new vessels elsewhere” (NVE). In some respects, the formation of new vessel can be viewed as an attempt by the retina to revascularize areas of capillary non-perfusion; however, this process does not occur in an orderly fashion and is largely unsuccessful at restoring any lost function. These new vessels penetrate the internal limiting membrane and form a dense capillary plexus between the inner surfaces of the retina or penetrate into the vitreous humor to grow along the outer surface of the vitreous body (46). The new vessels are also highly delicate and markedly permeable and may cause vision loss by intravitreal or pre-retinal (beneath the internal limiting membrane) hemorrhage. Early signs of changes in vasculature permeability can often be demonstrated by fluorescein angiography (FANG). In the late stages of the disease, these new vessels may regress, leaving only lattices of avascular fibrous tissue adhering to the retina and the posterior hyaloid membrane (42, 44). Fibroglial tissue may lead to mechanical deformation of the macula by putting traction on the retina as the vitreous body contracts, either with age or secondary to retinal ischemia (39). Retinal detachment may also occur, in some cases remaining stable for years, but other eyes rapidly progress to involve the macula and the rest of the retina, resulting in blindness if not rapidly reversed (42). Historically, the incidence of proliferative diabetic retinopathy had been as high as 40-50% in some populations after 20-25 years of diabetes; however, the figure is now more commonly ten to fifteen per cent, nearly a four-fold decline due largely to tight glucose control that is the hallmark of modern diabetes care (43-45). However, the absolute number of new cases of blindness has not been decreasing as rapidly because of the ever expanding numbers of patients with diabetes and the earlier age of onset. 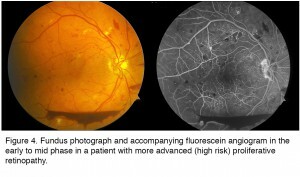 Figure 4: Fundus photograph and accompanying fluorescein angiogram in the early to mid-phase in a patient with more advanced (high risk) proliferative retinopathy. The patient whose imaging results are shown in Figure 4 illustrates many of the features of advanced PDR. There are blot and dot hemorrhages, flame hemorrhages (within the nerve fiber layer), cotton wool spots (infarcts in the nerve fiber layer), and neovascularization elsewhere (NVE) and of the disc (NVD). Inferiorly, there is a boat-shaped hemorrhage (in the lower portion of the image) that occurred some time ago. This eye has high risk features and requires treatment. The angiogram (Figure 4, right), taken at a later stage with dye filling both arteries and the veins, demonstrates leakage from the areas of NVE and NVD, as well as many more microaneurysms. Dye has leaked from the capillaries into the extracellular compartment so there is a background glow. However in some areas the capillaries have been obliterated and these areas of ischemia appear dark in appearance and are essentially dead. There is also enlargement of the foveal avascular zone (FAZ) in the central macula, which may limit central vision due to damage to the fine capillary network that services this essential region. There is also significant ischemia in the periphery (not shown). 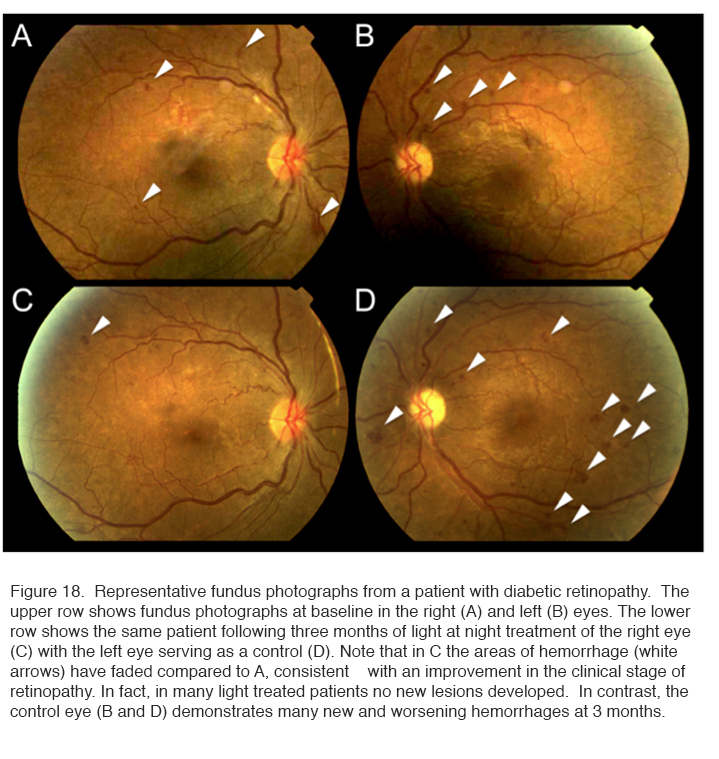 Figure 5: Advanced proliferative diabetic retinopathy with associated ischemic maculopathy. Note the laser scars form panretinal laser photocoagulation, including areas of focal grid laser treatment within the macula. The extensive capillary dropout represents end-stage diabetic retinopathy. Although additional laser may arrest the proliferative changes, very little vision remains secondary to the obliteration of the inner retinal vasculature. 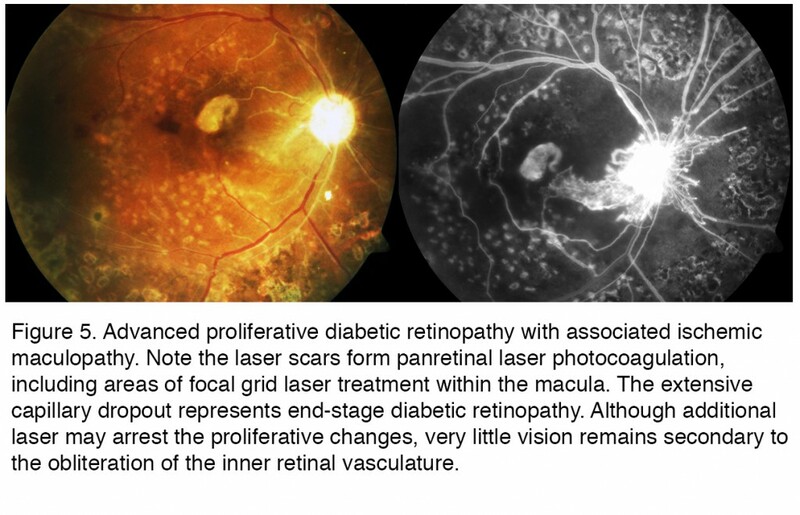 Figure 5 is from a patient with legal blindness from end stage diabetic retinopathy. This particular case is taken from a patient with type 1 diabetes who ran away from home at an early age. Living on the streets made it difficult if not impossible to handle her disease appropriately for many years. By the time she got treatment, in this case pan retinal laser photocoagulation (PRP) (seen as the scattered bright white spots in the color photography that act as window defects in the fluorescein due to the loss of pigment epithelium and overlying retina) the treatment was too late to arrest the progressive ischemic retinopathy. Ischemic maculopathy has developed, along with a central scar. Many of the larger retinal arteries and even some of the veins are no longer perfused, appearing as white ischemic vessels that remain unperfused on the FAZ. The optic disc is pale and yet new vessels emanate from the disc associated leakage seen in the FAZ. The patient unfortunately died from other complications from her diabetes in her late 20s. The progression of directly observable retinopathy often provides insight to the other complications of diabetes. One of the most serious complications of diabetic retinopathy is diabetic macular edema (DME). Most of the early manifestations of diabetic retinopathy involve the peripheral retina, where changes in retinal function may be silent because of the ability of the CNS to ignore defects that develop in the peripheral visual field (46). However, as DR progresses, retinal vascular changes increase not only in number and severity, and tend to spread to the central retina where they can involve the macula, the region of the retina that underlies high acuity vision (Figure 6). Anatomically, diabetic macular edema is the thickening of the center of the macula, i.e. fovea, due to the accumulation of fluid and plasma proteins as a result of leaky capillaries and a failure of the blood retinal barrier. Although the fovea is avascular, diabetes-induced damage to the fine capillary network that supports the function of this highly specialized region of the retina can lead to DME as the blood retinal barrier fails (40). Swelling that distorts the contour of the fovea (Figure 6), the neuroanatomical specialization at the center of the macula, can lead to a precipitous decline in visual acuity. DME usually presents as a progressive, painless loss of central vision. Patients usually report a decline in visual acuity that may develop suddenly or have a more gradual onset. DME requiring treatment may be present even when visual acuity is not yet significantly reduced (45, 46). The incidence of DME in the Wisconsin Epidemiologic Study of Diabetic Retinopathy (46-49) and the Early Treatment Diabetic Retinopathy Study (ETDRS) demonstrated that 6.4% of patients with DM develop permanent severe vision loss due to DME (44, 48-52). DME that occurs in the foveal center, if left untreated, can lead to permanent blindness (47-49). Extensive capillary closure, i.e. ischemic maculopathy, or scarring may also lead to vision loss (52). The development of optical coherence tomography (Figure 6), which uses timing or frequency differences in light reflected by different layers of the retina to examine the cross-section of the retina in real-time, has advanced our ability to diagnose and follow DME (53). 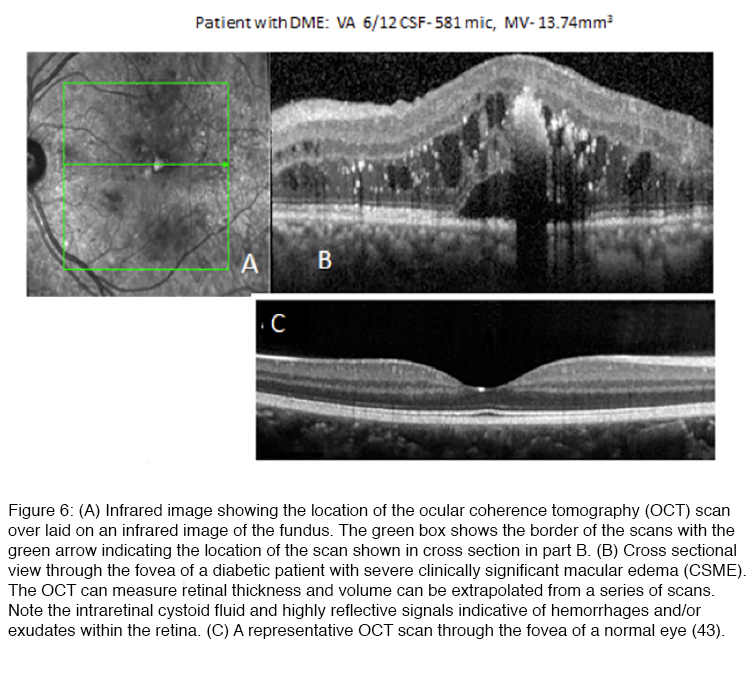 Whereas “clinically significant” DME was originally based on biomicroscopic finding of macular thickening in ETDRS, many cases of DME where there are mild increases in retinal thickening sufficient to impact vision may be missed without that aid of an OCT scan (Figure 6) (54). 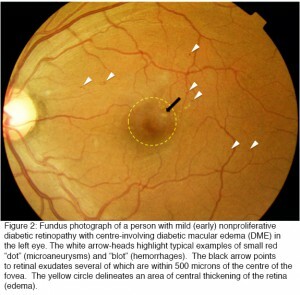 The standardised fundus photographs taken by screening centers (see Figure 2) have been used in attempts to grade the severity of a patient’s disease: The individual’s result is compared to a number of standardised views, by trained, registered observers whose estimates must agree. Either 2 or 7 standard areas of the retina are viewed and graded. This sort of quantitation has led to the Airlie House and the modified Airlie house grading (56, 57), which has proven value for research. The latest form of the grading appears in (27). The clinical usefulness of the classification has recently been questioned in view of the introduction of newer techniques like the OCT (55). Panretinal (scatter) laser photocoagulation (PRP) is effective in treating proliferative retinopathy, reducing the risk of severe visual loss by 50% (43). Figure 7 shows the end results of such treatment. The image is a collage of different areas of retina, photographed with the same equipment as the previous figures. Care is taken to avoid PRP in the central region or macula, as this would damage the central vision, although focal laser applications are sometimes used within macula to treat areas of leakage. 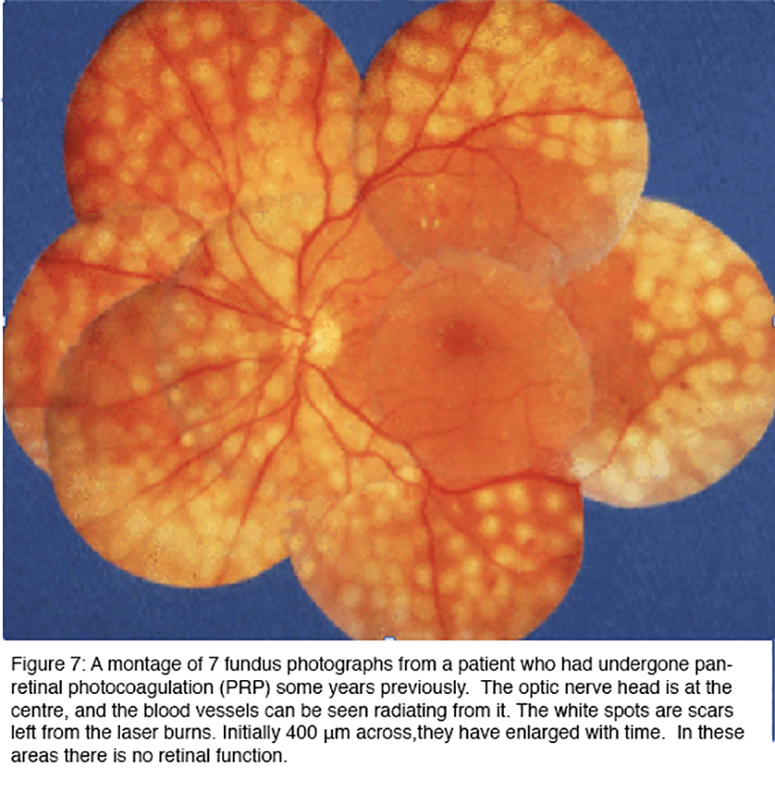 Figure 7: A montage of 7 fundus photographs from a patient who had undergone pan-retinal photocoagulation (PRP) some years previously. The optic nerve head is at the centre, and the blood vessels can be seen radiating from it. The white spots are scars left from the laser burns. Initially 400 μm across, they have enlarged with time. In these areas there is no retinal function. The white areas in Figure 7 are full thickness scars, in which the retina is dead. At first it was thought that the laser treatment prevented injurious substances leaking from those parts of the retina affected by diabetes (56, 57), but in fact, the burns can be placed anywhere in the peripheral retina and the treatment is successful in arresting progression of the disease as long as a sufficient area of the retina is treated. But the outcome is far from perfect. The treatment is often given after loss of visual acuity has already occurred, and it does not act to restore vision. Indeed after 5 years, slight further deterioration of acuity is the rule, although vision is conserved in patients who receive treatment compared to those who forgo PRP (58-60). Furthermore, the destruction of the peripheral retina has as an unavoidable side effect, loss of peripheral vision: and patients often complain of decreased night vision and reduced colour vision. Furthermore, the retinal nerve fiber layer in eyes that have been treated with PPR are thinner with abnormal cupping, but should not be mistaken for glaucomatous optic neuropathy (61). The ETDRS demonstrated a 50% reduction in moderate visual loss (≥ 15 letters) in eyes with mild to moderate nonproliferative diabetic retinopathy and “clinically significant” DME (62). While a small percentage of eyes treated with laser photocoagulation had improvement in visual acuity, most did not and with time lesions often developed into focal areas of chorioretinal atrophy or scarring. The superiority of intravitreal treatment with anti-VEGF agents, specifically ranibizumab monotherapy over focal laser alone has been noted for DME (63). In the treatment of DME, laser photocoagulation may still be used as an additional, or “rescue”, treatment. For example, in the case of the RISE and RIDE trials (identical, double-masked, sham-controlled, multicenter Phase III trials evaluating the impact of monthly ranibizumab injections on DME) laser was applied if it was found that central foveal thickness was >250 µm or if there was a 50-µm worsening from the prior month. Recently, the development of subthreshold photocoagulation promises to greatly reduce the risk of structural and functional retinal damage from laser treatment, while retaining the therapeutic efficacy of conventional laser treatment (55, 56, 60 64, 65). The development of the diode laser with micropulsed emission with a longer wavelength in the near-infrared (810 nm) greatly reduces the thermal diffusion to the neurosensory retina and allows focal treatment without a visible burn endpoint (61). Although no retinal damage is detectable at the time of treatment, changes from the laser treatment, i.e. scarring, still develops albeit in a smaller proportion of patients compared to conventional green laser photocoagulation (64, 65, 66). The situation has been transformed over the last decade with the introduction of intravitreal agents that target vascular endothelial growth factor (VEGF), one of the key cytokines whose abnormal expression has been strongly associated with the progression of diabetic eye disease. This discovery arose from an appreciation that angiogenesis of the retina of new-born animals was related to the development of local hypoxia in the retina driving the production of VEGF (67, 68). Soon after, increased VEGF expression was recognised in animal models of diabetes (69-71), as well as in samples of vitreous taken from patients operated upon for the complication of proliferative diabetic retinopathy (72). While awaiting FDA approval for ranibizumab (Lucentis), a humanized small antibody fragment (Fab) with a high binding affinity for human VEGF, was specifically designed for intraocular use (73, 74). With a smaller size compared to its parent molecule bevacizumab (Avastin) (75, 76), ophthalmologists began treating neovascular AMD with off-label bevacizumab (76). This has since become a widely adopted as a lower-cost alternative to ranibizumab. A new drug, aflibercept (Eylea), which targets all VEGF isoforms and PEGF, has been recently approved for the treatment of DME (77, 78). Ongoing studies indicate that these and related compounds may actually slow the progression of diabetic retinopathy (79). Furthermore, they are highly effective therapies for DME, often resulting in an increase in visual acuity, although some patients do not respond and other have such extensive damage that vision is permanently lost (80-85). Unfortunately, the effects are also too often short lived and the effects of diabetes progressive, necessitating repeat injections of these very costly medications (86). Delivery methods for sustained release of anti-VEGF therapy are under development (87). DME may also be treated with intravitreal glucocorticoids, particularly triamcinolone acetonide, dexamethasone, and fluocinolone acetonide. Beginning in the late 1990s, intraocular injection of triamcinolone acetonide was proposed as an adjunctive treatment of DME and numerous clinical trials for DME followed (88). In addition, in certain cases of DME that have proved refractory to anti-VEGF treatment, steroids may provide some benefit (89, 90). In addition, sustained release devices are available and approved from some ophthalmic indications, including diabetic macular edema (91). Although these medications can be effective, the risks associated with intravitreal administration of steroid medications, especially cataract formation and ocular hypertension or glaucoma, need to be taken into account. So the list of available treatments is short, and the results and access to treatment are not particularly inspiring. But the important message of this paper is that it is almost certain that an entirely new method of treatment, which is not only non-invasive and without side effects, but is also so inexpensive, and simple you can ‘do it yourself’ has been discovered. Below the rationale and the supporting evidence is given. Pathological features of diabetes can broadly be divided into acute metabolic problems and long-term complications stemming from hyperglycemia-induced dysfunction, broadly divided between those that affect the macrovasculature versus the microvasculature. The general metabolic problems associated with diabetes are largely due to: (1) decrease in the proper utilization of glucose, leading to high blood glucose levels that result in an osmotic diuresis as glucose spills into the urine; (2) abnormalities in lipid metabolism, leading to the deposition of cholesterol in arterial walls and atherosclerosis; and (3) increased ketone production, with the associated risks of diabetic ketoacidosis when insulin signaling is severely depressed for long periods of time. The most pronounced and often-cited effect of diabetes is a chronic rise in blood glucose levels. However, it is very unlikely that elevated blood glucose plays a singular causative role in the development of diabetic complications; many other cellular metabolic parameters are no less seriously altered by a lack of insulin signaling. Investigations of hyperglycemia on cellular metabolism have demonstrated that cells and tissues cultured in added glucose, or animal models made hyperglycemic by the injection of streptozotocin, experience both active and passive damage to their biochemical machinery. Increased concentration of available glucose triggers abnormalities in a range of metabolic pathways that collectively leads to “oxidative stress” as the concentration of a group of energetic radicals increases (92-94). Another line of enquiry relates to the formation of advanced glycosylated end-products (AGEs), which are modifications of proteins or lipids that become non-enzymatically glycosylated when exposed to aldose sugars and oxidative stress (95, 96). The formation of AGEs degrade the function of cellular enzymes of metabolism, as well as those that serve antioxidant functions, further contributing to oxidative stress. AGEs also contribute directly to the generation of reactive oxygen species (ROS) as a result of activating cellular mechanisms designed to rid the cell of damaged macromolecules. Oxidative stress occurs when the concentration of a group of energetic radicals increases (92-94). These are known collectively as ROS. ROS may include singlet or triplet oxygen, but the major contributor is the superoxide anion O2●−. In addition, in the presence of nitric oxide (NO), the oxygen radicals can react to form nitroso-compounds, but although these have slightly differing properties, and engage in different chemical reactions to the superoxide (97) this is ignored in the treatment that follows. Active species have short lifetimes and the superoxide ion rapidly transmutes into hydrogen peroxide (H2O2). The lifetimes of all these molecules depend very greatly on the local reducing environment. In cells they are surrounded by compounds and enzymes that quench them very effectively so that a sustained rise in the concentration of ROS requires either an overproduction or a reduction in the rate of their destruction. This is the case with diabetes where the production of ROS increases simultaneously with a decrease in the ability of endogenous quenchers. Of the ways in which ROS can be produced, the mitochondria are the most important (97, 98). ROS are produced by the normal operation of mitochondria producing ATP from oxygen and trioses derived from glucose (99-103) as part of the process of oxidative phosphorylation (Figure 8). In many types of cell increased blood sugar levels in diabetes lead to increased intracellular glucose, which enters via membrane glucose transporters (104, 105). Increased glucose concentrations drive mitochondrial oxidative phosphorylation, limited by the availability of oxygen, to produce ROS (92 99-103). Figure 8 diagrams the processes occurring in the mitochondrion. Because of the short half-life of ROS, it is common to measure their activity indirectly using reporter dyes, molecules that are chemically altered by oxidation (106, 107). 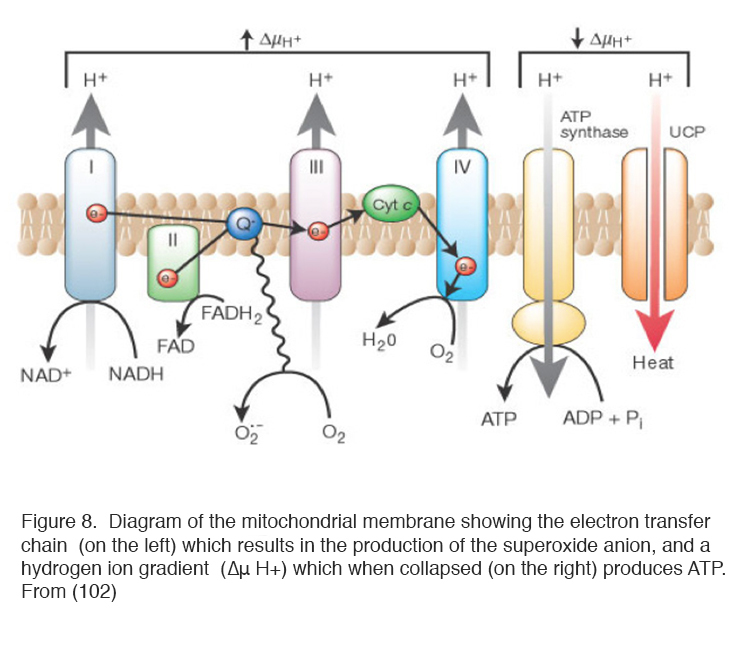 Figure 8: Diagram of the mitochondrial membrane showing the electron transfer chain (on the left) which results in the production of the superoxide anion, and a hydrogen ion gradient (∆μ H+) which when collapsed (on the right) produces ATP. From (102). It is now possible to introduce fluorescent proteins into the mitochondrial genome and observe the process of ROS production in real time. Confocal microscopy of reporter proteins transfected into cells has demonstrated that ROS are produced in localised places on the mitochondria, where electrons leak from the electron transfer chain (ETC) in brief pulses (107). About 5% of the oxygen is diverted into this pathway and modern techniques have shown that they are emitted as discontinuous flashes (146). Another method of production of ROS is situated in the cell membrane and involves the enzyme NADPH oxidase (109) (Figure 9). Its activity is controlled by a complex regulatory system that involves the G protein Rac (109, 110). In resting cells, a membrane-embedded heterodimer of two polypeptides (p22phox and gp91phox)—which also contains two heme groups and copper as well as a flavine adenine dinucleotide (FAD) group—enables the transfer of electrons from cytosolic NADPH across the membrane to molecular oxygen without NADPH oxidase activity. It is believed that the charge compensation occurs when gp91phox polypeptide also acts as a proton pump. Upon stimulation, a number of polypeptides (p47phox, p67phox, and p40phox) translocate to the inner face of the plasma membrane to form a fully active enzyme complex that contains NADPH oxidase activity. The central polypeptide gp91phox also acts as a Ca2+ or H+ channel, and the ROS produced appear to regulate signaling pathways (109, 110). 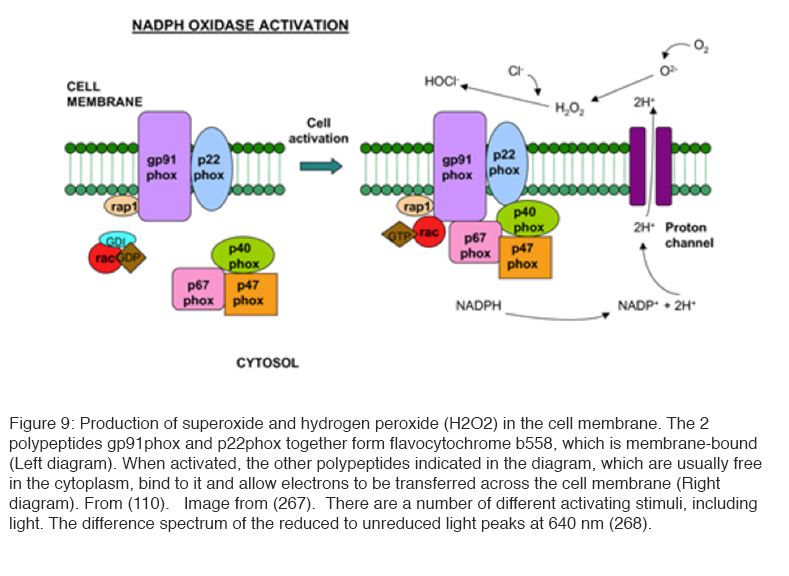 Figure 9: Production of superoxide (O2● −) and hydrogen peroxide (H2O2) in the cell membrane. The 2 polypeptides gp91phox and p22phox together form flavocytochrome b558, which is membrane-bound (upper diagram). When activated, the other polypeptides indicated in the diagram, which are usually free in the cytoplasm, bind to it and allow electrons to be transferred across the cell membrane (lower diagram). From (110). Image from (267). There are a number of different activating stimuli, including light. The difference spectrum of the reduced to unreduced light peaks at 640 nm (268). Most ROS are formed in a highly reducing environment inside cells, and must pass through cell membranes into the extracellular environment (which also contains quenchers) before they can diffuse to other cells. Oxidative stress makes membranes more permeable (111, 112), and reduces the quencher concentrations. But initially, in the early stage of diabetes, ROS are unlikely to travel more than a few microns, lasting for very short periods, before being captured and quenched, and therefore the earliest damaged in diabetic retinopathy occurs because of changes initiated intracellularly (113). Morphological evidence of intracellular oxidative stress is the swollen and disrupted cristae of mitochondria (114). Evidence of oxidative stress can be seen in many of the layers of the retina, for example the inner nerve fiber layer and ganglion cell layers, and this recently has been correlated with changes in the OCT (115). Localised oxidative stress in rodent retinal capillaries appears to develop rather late. Most of the ROS production however is in the photoreceptor layer (116). Although photoreceptor cells are major contributors to diabetes-induced oxidative stress and local inflammation, the functional disturbance to the phototransduction process is minimal, limited to the recovery rate after intense bleaching, and the responses to threshold stimulation (117-121). Despite this evidence, the precise mechanism by which hyperglycemia leads to the increased concentration of ROS is uncertain. In humans, there is no simple relationship between hyperglycemia and the development of retinopathy (122-124) (except for the very highest levels of hyperglycemia), so the determining factor may be when hyperglycemia reduces the capacity of antioxidant defences (125, 126). Experiments on tissues in raised glucose are usually confined to comparing the results in 5mM with 25 or 30mM glucose. In one case (studies implicating increased glucosamine with oxidative stress) (127), the threshold appears to be about 12mM. This corresponds to the highest levels of hyperglycemia found in normally functioning patients (122-124). At the glucose levels utilized in most biochemical investigations in excess of this level, patients would soon be severely ketotic or comatose with hyperosmolar non-ketotic decompensation syndrome, a condition that carries a mortality of 40% (128). It is therefore difficult to be sure that the ‘downstream’ abnormalities demonstrated in laboratory experimentation in “high” glucose have key roles to play in the development of retinal lesions, which develop in patients with relatively better controlled hyperglycemia. Rodents made diabetic with streptozotocin have body weights, which are up to 40% less than age-matched “controls”, and results obtained under these conditions are possibly not directly applicable to clinical situations either. In fact, oscillating levels of elevated blood glucose levels appear to be more damaging than persistently elevated levels (129). Hyperglycemia can only have a direct effect if it results in higher intra-cellular glucose. While glucose can penetrate some cell membranes, in most it is ferried by glucose transporters (130), and either the number of portals increases or each turns over faster. It is of interest that in human retinal endothelial cells grown in monoculture, glucose transport does not increase under conditions of excess glucose, intracellular hyperglycemia does not occur, and the cells in culture do not show signs of oxidative stress (130, 131). This leads to the conclusion that the damage to capillaries by ROS (which are fundamental to the development of diabetic retinopathy) is due to a paracrine mechanism, i.e. they are secondary to some less direct effects caused by hyperglycemia. Excess glucose not consumed by the tricarboxylic cycle may also be shunted to glycolytic pathways or enter the polyol (sorbitol) (133, 136) and hexosamine pathways leading to a build of up of metabolites that damages cellular function. Protein Kinase C (PKC) has also been found to be elevated in hyperglycemia. Increased glycolysis leads to the synthesis of diacylglycerol (DAG) which is a key activator of PKC. PKC in turn increases endothelial permeability, the production of VEGF, and leucostasis as well as endothelial cell proliferation (134, 135). Sorbital build up has been found in many cells (including retinal pericytes from diabetic animals). The reaction involves oxidation of glucose by NADPH, and this can cause a reduction of glutathione, one of the reducing agents that remove ROS (132), and increased accumulation of sorbitol is also thought to cause osmotic damage (133). Activation of these metabolic pathways leads to microvascular dysfunction, neuronal apoptosis, glial reactivity and inflammation (137, 138) (Figure 10). 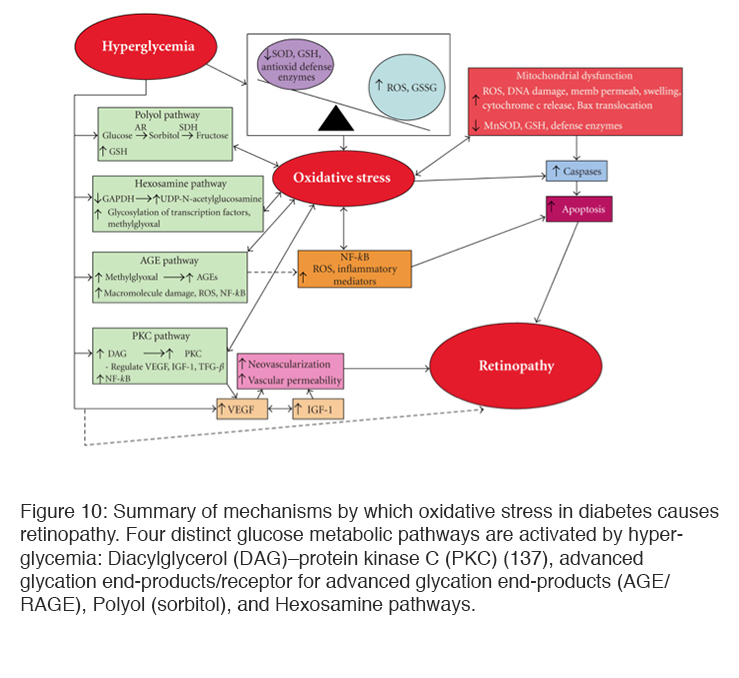 Figure 10: Summary of mechanisms by which oxidative stress in diabetes causes retinopathy. Four distinct glucose metabolic pathways are activated by hyperglycemia: Diacylglycerol (DAG)–protein kinase C (PKC) (137), advanced glycation end-products/receptor for advanced glycation end-products (AGE/RAGE), Polyol (sorbitol), and Hexosamine pathways. Mitochondria also respond to hypoxia. The first effect is to reduce the formation and release of ROS (139, 140): However mitochondria and other cell-surface mechanisms, also initiate signaling cascades that increase ROS (141-143, 144-152). The effect of alteration of the ROS output is however uncertain because change in pO2 can also increase the output of quenchers, (148) at the same time as ROS are increased. Hyperglycemia also results in the formation of complex molecules known as advanced glycosylation end products (AGEs) that affect the development of oxidative stress in several different ways (148) (Figure 11). Figure 11. Mechanism of production of advanced glycation end-products (AGEs). From (136). AGES contribute to the thickened basal membranes found in diabetes, which hinder diffusion of oxygen and nutrients both from blood to extracellular fluid and also within tissues. In additions, there are smaller molecule AGEs which interact with a receptor named RAGE, found on Müller and other cells, which, when satisfied, contribute directly to oxidative stress by directly affecting the NADPH oxidase system (149). RAGE also causes apoptopic cell death of retinal neurones by a mechanism involving the overproduction of nitric oxide (150). AGEs also directly affect retinal blood vessels causing leakage which is associated with increased VEGF and VEGF mRNA expression (95, 96, 150). The immediate effect of hypoxia is to reduce the production of ROS, as would be expected as the metabolism of the mitochondria slows (150). But part of the mechanism of production of ROS, the NAD/NADH ratio is changed by AGEs, producing “pseudo hypoxia”, and this change increases oxidative stress (109, 144, 147). Many of the pathways involved in producing oxidative stress-induced cell death have been investigated by using selected animal models in which the activity of a particular pathway is increased. If the same experiments are carried out in animals in which quenchers are also increased, oxidative stress is reduced or may not appear (152, 153). If the stimulus driving oxidative stress is removed (e.g. hyperglycemia reduced) biochemical changes may not be restored to normal. It has been shown that ROS and reactive nitrogen species (RNS) activate a spectrum of transcription factors, including nuclear factor kappa B (NFκB), AP-1, p53, Ets transcriptional factor (Ets-1), hypoxia-inducible factor-1α (HIF-1α), and Nrf2. (154, 155) and following reversal of hyperglycemia to normoglycemia the transcription and regulation of proteins remains affected for months. This has been described as ‘molecular memory’ and due to changes in the nucleus. Damage to mitochondrial DNA also occurs(151, 155), and variations in mitochondrial DNA are associated with different probabilities of development of severe diabetic retinopathy (156) related, at least in part, to the expression levels of particular proteins. Amongst these is the expression of Vascular Endothelial Growth Factor (VEGF), interleukin 2 and transforming growth factor (TGF). All this experimental work has provided a number of blocking agents which can reduce the production of oxidative stress in laboratory conditions (157-171), but almost all have had inconclusive results in subsequent clinical trials (171-176). This has been explained (155) by the hypothesis that so many biochemical pathways contribute to and result from oxidative stress that blocking one is relatively ineffectual (108, 177). The relatively spectacular improvement seen clinically with anti-VEGF drugs emphasises the importance of this cytokine as a final common pathway of damage to the retina and its vasculature. In turn the damage caused by excess VEGF prompts the production of abnormal concentrations of other related growth factors. Another observation quite unexplained, is the finding that in dogs, after 5 years of hyperglycemia, pericyte loss and capillary dropout occurs in retinal capillaries but not in brain (178): there appears to be a specific retinal cause for diabetic retinopathy, although the two tissues have the same neuroectodermal origin. In addition to the biochemical changes discussed above, which may cause the clinical vasculopathy, it has been known for many years that retinal neuronal damage occurs early in the condition (179). The examination of human post-mortem material (180) showed loss of tissue and excess TUNEL staining characteristic of apoptosis (181, 182). Thinning of the retina in living diabetic patients has been described (183). However the damage is selective: Ganglion cells and short wavelength cone receptors are preferentially damaged (184). Experiments on streptozotocin-induced diabetes in rodents (185) have led to similar claims. Thus more apopotosis has been claimed by some (186, 187), but has been reported absent by others (188). An example of damage to astrocytes and disappearance of connexin-43 normally seen in association with astrocytes is shown in Figure 12 (187). Electrophysiological testing (189-191) both in man and rodents indicates inner retinal functions are disturbed much more than outer retinal function (31, 191). In psychophysical testing, losses in tritan colour vision, originally thought to be due to scattering changes, have been shown to be neural, to occur very early, and to be ameliorated by oxygen inhalation (192). Similar aberrations are seen with other psychophysical measures (189, 193-196). 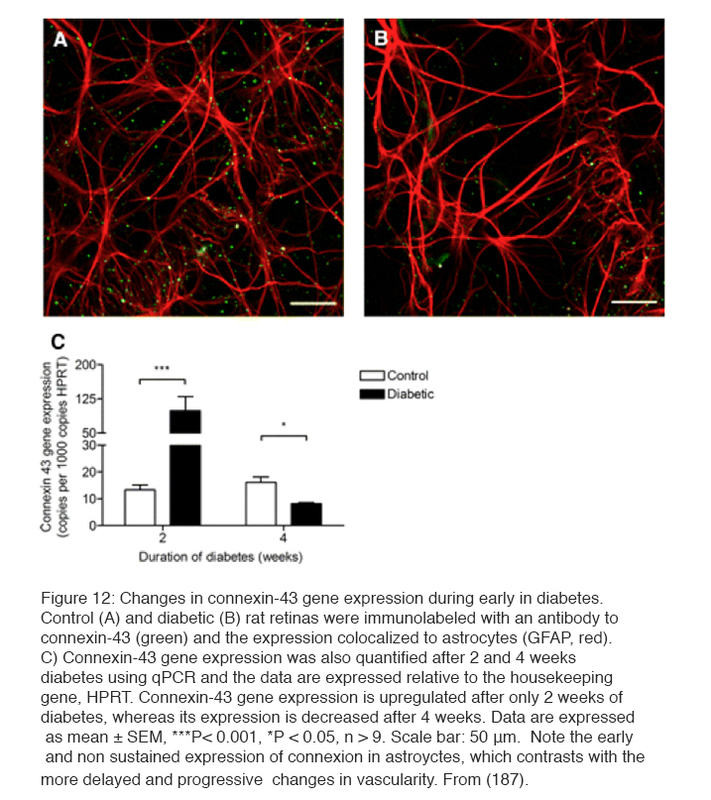 Figure 12: Changes in connexin-43 gene expression during early in diabetes. Control (A) and diabetic (B) rat retinas were immunolabeled with an antibody to connexin-43 (green) and the expression colocalized to astrocytes (GFAP, red). C) Connexin-43 gene expression was also quantified after 2 and 4 weeks diabetes using qPCR and the data are expressed relative to the housekeeping gene, HPRT. Connexin-43 gene expression is upregulated after only 2 weeks of diabetes, whereas its expression is decreased after 4 weeks. Data are expressed as mean ± SEM, ***P< 0.001, *P < 0.05, n > 9. Scale bar: 50 μm. Note the early and non-sustained expression of connexion in astroyctes, which contrasts with the more delayed and progressive changes in vascularity. From (187). There is some doubt about whether the neural changes precede the onset of the vasculopathy (197-198). Most biochemical experiments are studies after >4 week period of diabetes (216). Hypoxia and inner retinal neural changes have been reported at 2 weeks and the earliest vascular changes (leakage of fluid from retinal capillaries) can only be seen after 4 weeks. The early neuronal changes (187, 197, 198, 200) also occur in the absence of changes in the ERG which are dependent on the outer retina (201) (and see below). So it is possible that vascular and neuronal changes in the rodent retina are produced by different mechanisms, just as may be the case in man. In superfused retinal slices, patch clamp recordings have demonstrated changes in glutamate release and activity in the rod pathway. These changes in spontaneous excitatory postsynaptic currents (spEPSCs) are an indicator of retinal neuronal activity and are controlled by hyper-glycemia. Thus excess activity in spEPSCs can be seen in the rod bipolar terminals recorded in slices from the retinas of rats made diabetic with streptozotocin (202). The activity returns to normal when the superfusing saline contains less glucose. The rod bipolar cell has a metabotropic glutamate receptor at its synapses with rod photoreceptors, and becomes depolarised on light stimulation. It releases glutamate at its axonal synapses with AII and A17 amacrine cells (see chapter in Webvision on Rod pathways through the retina). The glutamate release is increased in diabetics and returns to normal if the superfusing fluid does not contain extra glucose. The glutamate affects the α-amino-3-hydroxy-5-methyl-4-isoxazolepropionic acid receptor (AMPAR) receptor in A17 cells. This, by affecting [Ca2+]in , reduces the inhibitory GABAc receptor activity at the rod bipolar cell and A17 synapse, and, in turn, still further increases the glutamate output by the rod bipolar cell (Figure 13) (202) (see chapter in Webvision on GABAc in the retina). Figure 13: The rod bipolar- to-A17-amacrine feed-forward and feed-back interactions are affected by hyperglycemia. The rod bipolar cell (RBC) has postsynaptic metabotropic glutamate receptors, activated by rod signals. Its presynaptic surface is in a dyad into which the RBC releases glutamate. A17 amacrines and AII amacrines complete the dyad. 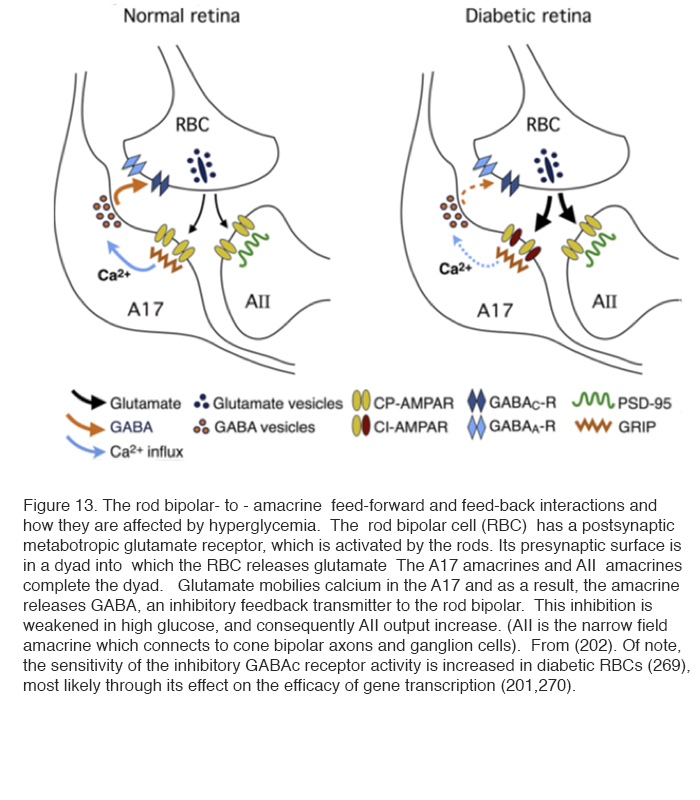 Glutamate mobilizes calcium in the A17 and as a result, the amacrine releases GABA, an inhibitory feedback transmitter to the rod bipolar. This inhibition is weakened in high glucose, and consequently RBC output increases, as does AII output. (AII is the narrow field amacrine which connects to cone bipolar axons and ganglion cells). From (202). Of note, the sensitivity of the inhibitory GABAc receptor activity is increased in diabetic RBCs (269), most likely through its effect on the efficacy of gene transcription (201,270). Thus not only does there appear to be a specific retinal cause for diabetic retinopathy (178), but also this cause is linked to hypoxia and metabolic overload, both in neuronal and vascular retinal elements. This was the trigger for the new hypothesis discussed below. Hypoxia, driven by dark adaptation, accelerates the development of diabetic retinopathy (189, 203-205). 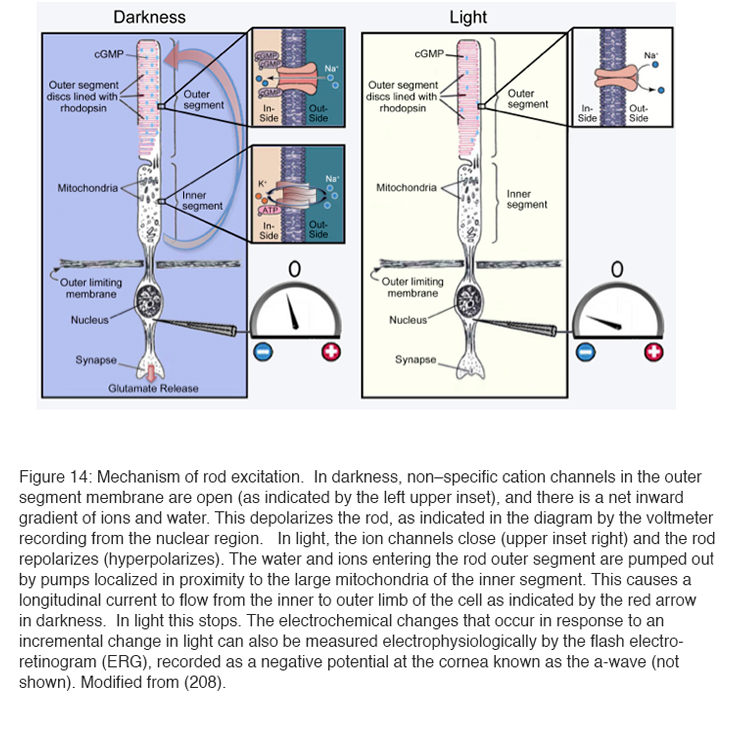 There are several reasons why this occurs: Rod photoreceptors in the outer retina are maximally depolarized in the dark and continuously release large amounts of their neurotransmitter glutamate and this increases energy utilization and oxygen consumption (206-208) (Figure 14). Figure 14: Mechanism of rod excitation. In darkness, non–specific cation channels in the outer segment membrane are open (as indicated by the left upper inset), and there is a net inward gradient of ions and water. This depolarizes the rod, as indicated in the diagram by the voltmeter recording from the nuclear region. In light, the ion channels close (upper inset right) and the rod repolarizes (hyperpolarizes). The water and ions entering the rod outer segment are pumped out by pumps localized in proximity to the large mitochondria of the inner segment. This causes a longitudinal current to flow from the inner to outer limb of the cell as indicated by the red arrow in darkness. In light this stops. The electrochemical changes that occur in response to an incremental change in light can also be measured electrophysiologically by the flash electroretinogram (ERG), recorded as a negative potential at the cornea known as the a-wave (not shown). Modified from (208). In darkness rods consume more oxygen than any other cell in the body (208-210) because the water and ions entering the rod outer segment need to be pumped out by pumps localized near the large mitochondria of the inner segment (Figure 14) (this pumping has similarities to a fireboat squirting out extreme amounts of water, Figure 15). 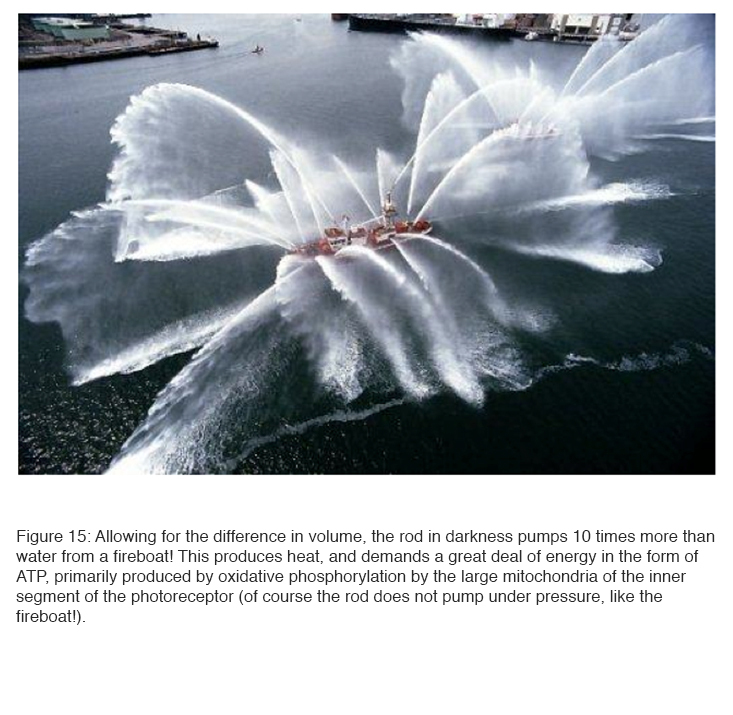 Figure 15: Allowing for the difference in volume, the rod in darkness pumps 10 times more than water from a fireboat! This produces heat, and demands a great deal of energy in the form of ATP, primarily produced by oxidative phosphorylation by the large mitochondria of the inner segment of the photoreceptor (of course the rod does not pump under pressure, like the fireboat!). Even though the choroidal blood supply is very profuse, the partial pressure of oxygen at the level of the inner segments of the photoreceptors is near zero in darkness compared with the 30 mm Hg common in most tissues. In animal experiments, the partial pressure of oxygen rises suddenly and briefly when the retina is stimulated by a flash of light (211). With normal oxygen concentrations, the rods receive sufficient oxygen, but if oxygen is reduced somehow, the rod sensitivity falls. This occurs with only a modest reduction of oxygen corresponding to a reduction in air pressure that occurs at an elevation of about 4000 ft. Thus, in commercial jet aircraft, which are pressurised to around 7000 ft., healthy normal observers have slightly reduced rod sensitivity and some individuals, particularly those with heart or lung disease, may experience symptoms of dimmed vision, fatigue, nausea, headaches, loss of consciousness, and (on extended flights) even pulmonary edema or death from altitude sickness (212). Consequently, if in retinal disease the availability of oxygen is reduced due to decreased function of the retinal circulation, or the relative demand for oxygen increases due to metabolic stress, there will be an imbalance which will lead to hypoxia in not only the outer retina (which is avascular) but also in the inner part, which is supplied primarily, but not completely, by the retinal arterial circulation. These processes are diagrammed in Figure 16. 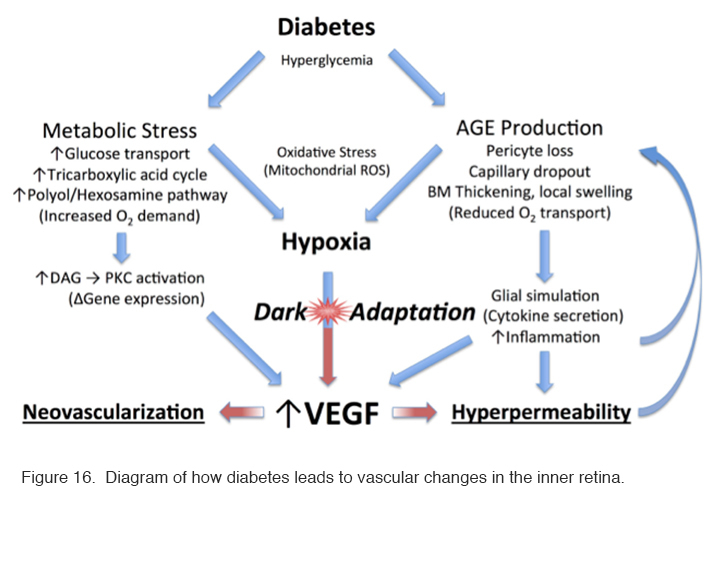 Figure 16: Diagram of how diabetes leads to vascular changes in the inner retina. Increased blood sugar levels in diabetics will lead to increased glucose transport through cell membranes in many cell types (but not apparently in rods due to their high affinity glucose transporters) (130, 131). On entering the tricarboxylic cycle, the excess sugars will lead to an increased demand for oxygen. This also results in the formation of advanced glycosylation end products (AGEs), which are modifications of proteins or lipids that become non-enzymatically glycosylated when exposed to aldose sugars and oxidative stress (213-215). Recent experimental evidence shows that rod photoreceptor cells are major contributors to diabetes-induced oxidative stress by producing reactive oxygen species and local inflammation in the retina (216). These changes accumulate with time affecting both intracellular and extracellular function and by engaging the receptor for advanced glycation end products (RAGE). Activation of RAGE by AGEs causes upregulation of the transcription factor nuclear factor κ β (NFκβ) and its target genes. In Müller cells this promotes the expression of glial fibrillary acidic protein (GFAP) which is seen very early in diabetes, and the secretion of the cytokine, VEGF. As already alluded to above, VEGF causes changes to small vessels and makes them leaky (VEGF was initially identified as a vascular permeability factor [VPF] (217). Other AGEs contribute to the increase in basal membrane thickness which occurs in many tissues, including the capillaries of the retinal circulation (218-222). All these factors reduce oxygen transport into the retina. Additional biochemical alterations are known to occur in the diabetic retina, but once hypoxia is established, it will cause a cascade of effects that drive the production of VEGF (Figure 16) leading to further changes associated with diabetic retinopathy: and these changes in turn will exacerbate any underlying hypoxia. Since a major cause of retinal hypoxia is the demand of the rods during periods of dark adaptation, reducing rod dark current should ameliorate diabetic changes. However, many other biochemical changes seen in diabetic retina have been connected to the overproduction of reactive oxygen species. (223). If these pathways are more important than the rod oxygen demand, increasing the retinal oxygen tension could either have little effect, or might even accelerate the progression of diabetic retinopathy. However, pan-retinal laser photocoagulation, the mainstay of treatment for proliferative diabetic retinopathy, has been shown to restore local oxygen levels to normal within weeks of its application (224). It is thought to work mainly by destroying large numbers of rods in the peripheral retina thereby increasing the oxygen supply to the remaining tissue (225). Furthermore, vascular responsiveness to oxygen inhalation also improves following photocoagulation (226-228). The success of panretinal photocoagulation is mainly because the treatment destroys rod photoreceptors, thereby reducing oxygen demand of the outer retina, particularly under dark adapted conditions. The remaining rods benefit, but even more importantly, there is improved ability of oxygen to reach the inner retina from the choroid because of the reduction in the number of rod photoreceptors with their oxygen-absorbing mitochondria. This may change the balance in the supply of oxygen to the inner retina, which already has a compromised retinal circulation. The use of anti-VEGF drugs is now the most common initial treatment for diabetic eye disease, and hypoxia is the major determinant of VEGF production, but this is almost a circular argument. Direct measurement of oxygen tension in diabetic cat retina shows that the inner retina is more hypoxic than that of normal felines even in regions where there is no capillary dropout evident (229, 230) (Figure 17). 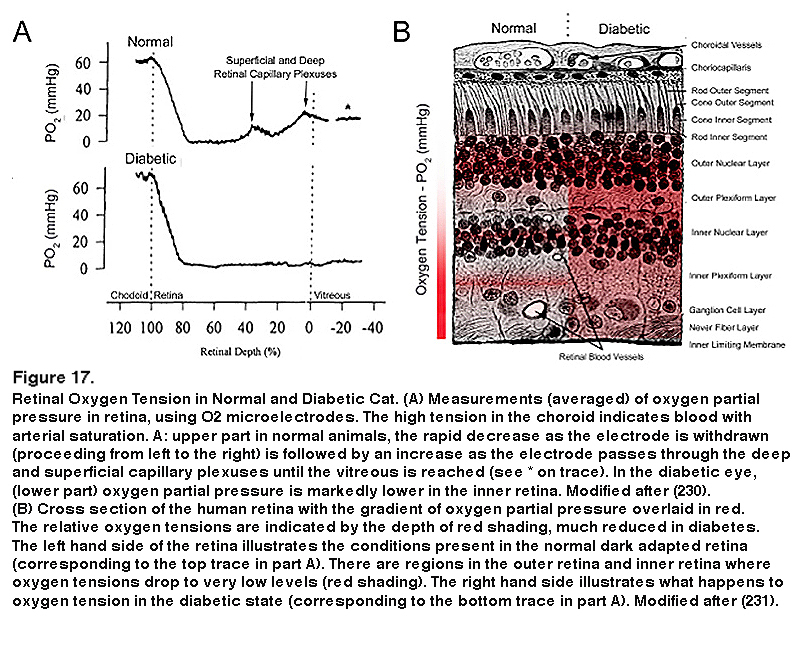 Figure 17: Retinal Oxygen Tension in Normal and Diabetic Cat. (A) Measurements (averaged) of oxygen partial pressure in retina, using O2 microelectrodes. The high tension in the choroid indicates blood with arterial saturation. A: upper part in normal animals, the rapid decrease as the electrode is withdrawn (proceeding from left to the right) is followed by an increase as the electrode passes through the deep and superficial capillary plexuses until the vitreous is reached (see * on trace). In the diabetic eye, (lower part) oxygen partial pressure is markedly lower in the inner retina Modified after (230). (B) Cross section of the human retina with the gradient of oxygen partial pressure overlaid in red. Red regions are more oxygen poor. The left hand side of the retina illustrates the conditions present in the normal dark adapted retina (corresponding to the top trace in part A). There are regions in the outer retina and inner retina where oxygen tensions drop to very low levels (red shading). The right hand side illustrates what happens to oxygen tension in the diabetic state (corresponding to the bottom trace in part A). Modified after (231). The partial pressure of oxygen falls rapidly from the arterial level when the electrode moves from the RPE into the outer retina, and in darkness reaches a level of zero in the region of the rod inner limb mitochondria (229, 230). This rate of decline is the maximum theoretically possible if the choroid is an infinite source of oxygen, and the mitochondria, an infinite sink. As the electrode tip moves into the inner vascularized retina (see Figure 17A, top left tracing) the partial pressure increases again. Calculation shows that the rod mitochondria must also be absorbing oxygen from the retinal vessels. In light the oxygen tension is higher for all retinal locations, but especially at the level of the rod inner limbs, where it increases by about 30 mm Hg. (not illustrated). This shows how rapid the rate of respiration is, and how quickly it is affected by the processes of transduction. In addition in diabetic cat retina, even in regions in which there is no capillary dropout, the inner retinal oxygen tension is lower than in normal retina (Figure 17). There are also species differences in the oxygen tension profiles. In the miniature pig (224) and macaque (232), although the profiles resemble those shown in Figure 17A (from the cat (211)), the pO2 at the level of the inner limbs does not fall to zero but about 5 mmHg. Nevertheless the outer retinal oxygen consumption greatly exceeds the inner retinal oxygen consumption. In guinea pigs (232) and rabbits (232, 235) animals with poorly developed retinal vessels, more of the inner retina’s oxygen supply is provided by the choroid, but the same general relationships may be seen, and oxygen consumption and hypoxia of the outer retina increases as the photoreceptors develop and their outer limbs lengthen. In the species studied in dark adaptation, diabetic animals have an inner retinal hypoxia more evident than in controls (224, 234). However, in the rat retina, the retinal profiles are different especially in the RCS rat (232), with the minimal pO2 being found in the inner not the outer retina. Nevertheless the difference in oxygen consumption when in light or darkness is greatest in the outer retina, and corresponds to photoreceptor usage. This is supported by the change in profiles in the developing retina, and the change in profile when photoreceptor degenerations develop (233-235). So, in rat (199), direct measurements of intraretinal pO2 using oxygen microelectrodes have not shown hypoxia or change in diabetes. However, this last observation is difficult to reconcile with the other data measured in larger eyes, which are similar to human eye size (195, 235, 236) and to indirect evidences of rod-associated retinal hypoxia (237-239). Human beings have many inherited diseases that selectively destroy rods, producing retinal dystrophies – Retinitis Pigmentosa is the most common of these conditions. Rod loss in many cases is slow, and diabetes can occur independently in conjunction with the slow loss of photoreceptors. However, in such patients, diabetic retinopathy-type changes rarely happen (Table 1) (240). Table 1: Incidence of diabetic retinopathy in patients with both diabetes and rod degenerations (retinitis pigmentosa): None of the patients (discovered by a web-based search of patient-societies with surveys validated by attending ophthalmologists) has the characteristic changes, though many had severe vascular and other disease in other organs attributable to diabetes, adapted from (240). Another line of evidence comes from patients with maternally inherited diabetes and deafness (MIDD). These patients have mutation of mitochondrial DNA at position 3243 which manifests in a number of ways and can cause a type of retinal degeneration. This may or may not occur together with diabetes. If the retinal degeneration occurs together with the diabetes, the incidence of microaneurysms is less than if the diabetes occurs alone (241-243). In some individuals, the efficiency of hypoxia in increasing VEGF and VEGF RNA levels is much reduced and can be seen by incubating white blood cells under normoxic and hypoxic conditions. Among this group, retinopathy does not appear in individuals who also have diabetes (243). In addition, breathing oxygen improves several visual functions in patients with diabetic retinopathy and DME (192, 193, 196, 189, 244, 245). Finally, patients with diabetes who have sleep apnea, (defined as more than 5 periods, called dips, when oxyhemoglobin saturation falls below 90%), have more rapid development of diabetic eye complications than those who do not have sleep apnea. The increased risk is reduced in patients with sleep apnea who are treated with positive pressure ventilation (246-250). There are several recent reviews that include a more detailed discussion of the hypothesis that rod photoreceptor dark adaptation causes hypoxia and consequent damage to the retina in diabetic retinopathy (251, 252). Given all the above evidence that hypoxia in the inner retina in diabetic patients causes the vascular damage of diabetic retinopathy, and evidence that rods are responsible for most of the oxygen consumption during their active metabolic time in darkness, it seems reasonable to suggest that curbing the rod activity at night would be beneficial. A simple treatment for impending diabetic retinopathy might be to prevent rod activity during darkness by the application of constant nocturnal light. This is the basis for the new treatment paradigm described below. We have carried out clinical trials, in which patients wear “light masks” which provide retinal illumination through the closed eyelids during sleep. Sufficient light penetrates the lid to partially light adapt the rods. The light sources were either chemo-luminescent (glow-patches) or light-emitting diodes (LEDs). The green or blue-green light was used to selectively stimulate rods (95% of all photoreceptors are rods) rather than cones, because the sensations aroused by rod stimulation are less intrusive and tend to fade to insignificance as patients adapt to a low background luminance. In order to reduce inter-personal differences, the subjects wore masks which illuminated only one eye, with the other, in darkness being used as a control (253). The results of a 6 month Phase I trial showed that no adverse reactions were encountered and patients accepted the idea of wearing a mask during sleep. However, unusual for a Phase 1 trial, the therapy caused a significant improvement in the 10 trial eyes relative to their controls. Figure 18 shows the results in one patient. Figure 18: Representative fundus photographs from a patient with diabetic retinopathy. The upper row shows fundus photographs at baseline in the right (A) and left (B) eyes. The lower row shows the same patient following three months of light at night treatment of the right eye (C) with the left eye serving as a control (D). Note that in C the areas of hemorrhage (white arrows) have faded compared to A, consistent with an improvement in the clinical stage of retinopathy. In fact, in many light treated patients no new lesions developed. In contrast, the control eye (B and D) demonstrates many new and worsening hemorrhages at 3 months. Fundus photographs such as shown in Figure 18 were examined under high magnification and the total areas of microaneurysms measured. The improvement in the condition (decrease in areas of affected central retina) was significant. A similar result was obtained when changes in tritan – blue-yellow – colour vision (known to be damaged early in diabetic retinopathy) was assessed (253) (not shown). In a Phase II trial of 42 patients with non-center-involving DME, a similar benefit was shown. A high proportion of the treated eyes improved, while this did not occur in untreated eyes (Table 2). Much of this occurred during the first 3 months. Furthermore, whereas four of the patients recruited to the trial dropped out because the unilluminated fellow eyes received laser or intravitreal bevacizumab for DME during the study, none of the illuminated eyes required such treatment. Table 2: Change in DME at 3 months. Initial clinical results looking at change in macular thickness in a Phase II trial demonstrated that a majority of eyes treated with light at night improved, while untreated eyes in the fellow patient more often stayed the same or even worsened over the course of the trial (254). 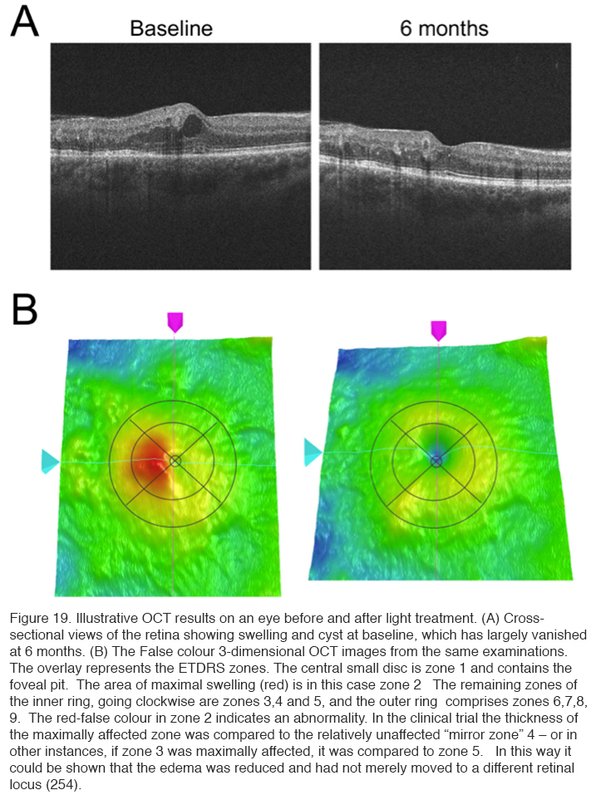 Ocular coherence tomography showed that cysts characteristic of DME disappeared, and significant reduction in thickness occurred (Figure 19) (254). The results of these changes in OCT measurements are shown in Table 3. Figure 19: Illustrative OCT results on an eye before and after light treatment. (A) Cross- sectional views of the retina showing swelling and cyst at baseline, which has largely vanished at 6 months. (B) The False colour 3-dimensional OCT images from the same examinations. The overlay represents the ETDRS zones. The central small disc is zone 1 and contains the foveal pit. The area of maximal swelling (red) is in this case zone 2. The remaining zones of the inner ring, going clockwise are zones 3, 4 and 5, and the outer ring comprises zones 6, 7, 8, 9. The red-false colour in zone 2 indicates an abnormality. In the clinical trial the thickness of the maximally affected zone was compared to the relatively unaffected “mirror zone” 4 – or in other instances, if zone 3 was maximally affected, it was compared to zone 5. In this way it could be shown that the edema was reduced and had not merely moved to a different retinal locus (254). Table 3: Summary of changes in OCT measures. The zones are illustrated by the overlays of the OCT images in Figure 19 (254). The patients in this trial had very early DME, and in many patients the swelling did not involve the area within 300 μm of the fovea. Hence if there is a reduction observed in local swelling in one retinal region, might swelling simply be occurring in another region? In order to evaluate this, measurements were made in the Early Treatment Diabetic Retinopathy (ETDRS) zones, and the region with maximal swelling was compared to its opposite “mirror” zone. 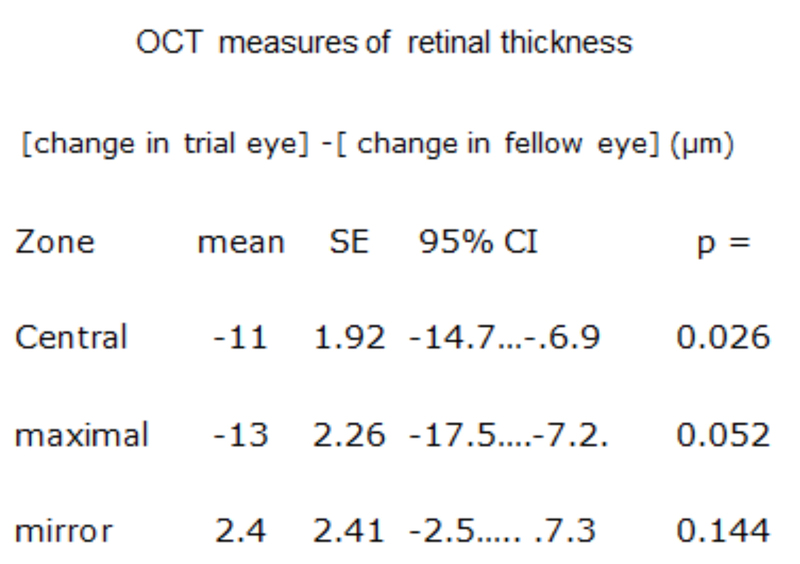 It can be seen that decrease in thickness occurs only in treated eyes (Figure 20). 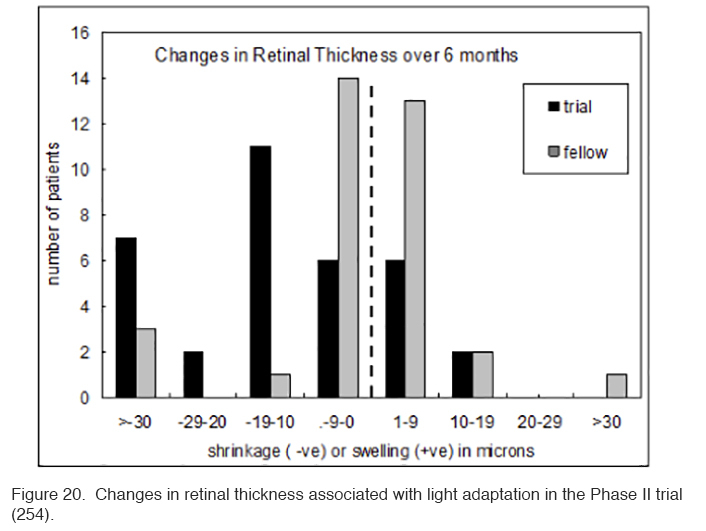 Figure 20: Changes in retinal thickness associated with light adaptation in the Phase II trial (254). A small but significant improvement in visual acuity and contrast sensitivity also occurred among the light adapted eyes in this trial (table 4). It should be noted, that almost all the patients recruited were at an early stage of diabetic retinopathy with DME and had good visual acuity at baseline so a larger average increase in acuity would not be expected. 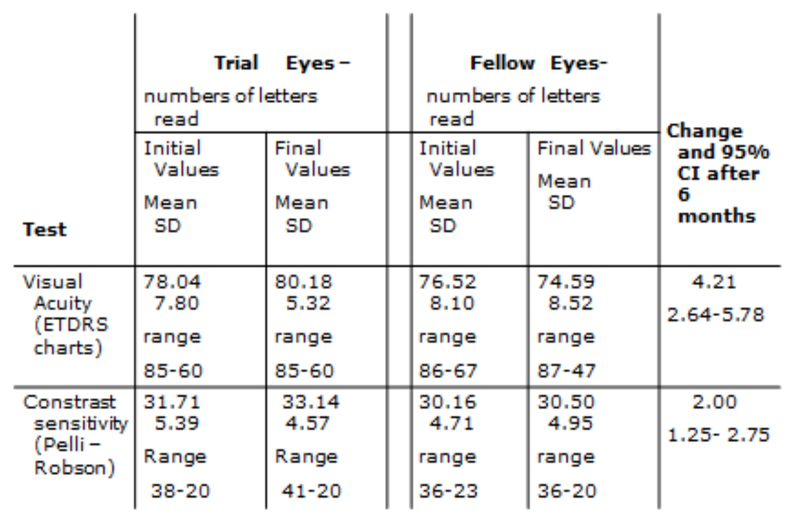 Table 4: Summary of results of visual acuity and contrast sensitivity testing in study and fellow eyes in a Phase II trial of light adaptation (254). Such studies provide a “Proof of Principle” that retinal hypoxia in darkness must be an important driving force for diabetic retinopathy. However, further work is required to establish the role that ‘light-at-night’ may play in the treatment or prevention of the various complications of diabetic eye disease. Furthermore, we do not know how ‘light at night’ interacts with the other treatments for the condition. For this Phase III and IV clinical trials are required. This presents a difficulty, because for new pharmaceuticals, such trials are largely funded directly by the drug companies, while there is no such equivalent for medical devices. Small commercial companies have manufactured masks which can be used in such trials, and apparently in one trial carried out in the Department of Ophthalmology, Vinohrady, Prague, Czech Republic, produced encouraging results. These results have not been published in detail yet. Further trials are starting in London (255) Cardiff (UK) (256) and Boston (USA). There is a considerable need for this research because the cost of the present day “gold standard” treatment of repeated injections is becoming unsustainable (257). (Figure 21 refers of age related macular degeneration, but for diabetes the same economic criteria will apply). Figure 21: Health economics results of treatment of neovascular age related macular degeneration (AMD). Relative costs (£) of treatment by ranibizumab (Lucentis) and bevacizumab (Avastin) used at fixed intervals (continuous) or when required (discontinuous). Note the logarithmic ordinate. Lucentis is 40 times more costly to purchase than Avastin, but the difference in the total cost of treatment is much less. At the right, the median incomes in a number of different countries are indicated. Note only in the most affluent countries is the use of these drugs even possible for most of the population at risk. The cost estimate shown in this figure would be similar for DME. From (257). 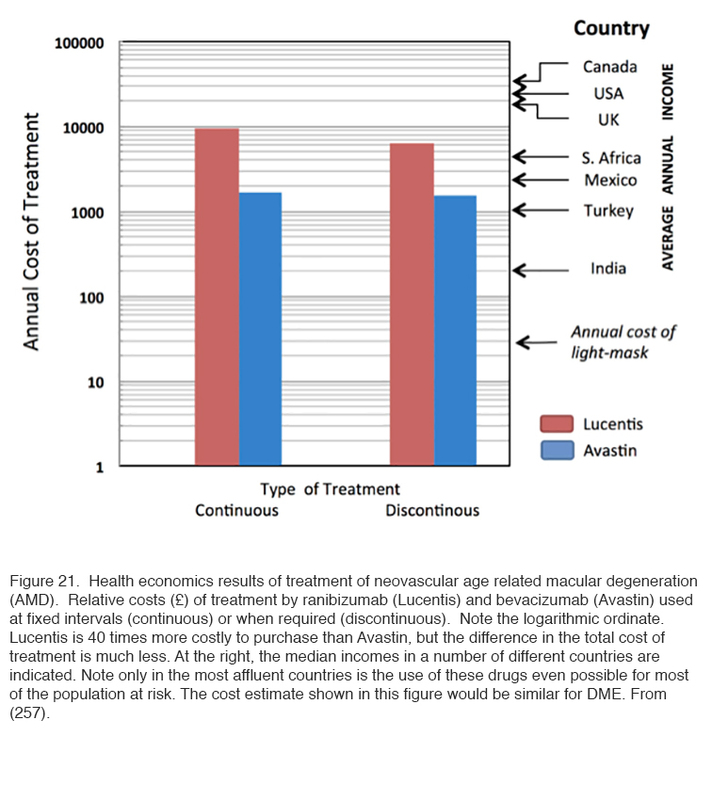 Anti-VEGF drugs are expensive: Avastin costs about 1/40th of the price of Lucentis, but the cost of treatment by the two is not so different, in part because of the associated cost of administration (Figure 21). But only in the first world are incomes high enough for a significant proportion of the population with vision threatening diabetic eye disease to access treatment (257) and even then many individuals with vision threatened by complications from diabetes are not accessing available eye care (258). Worldwide there is not only a shortage of funding for available treatments, but a severe shortage of personnel trained to diagnose the condition and manage it appropriately (259). By contrast, the requirements of light-based treatment to interrupt nocturnal dark adaptation, for example through the use of a light masks, are relatively inexpensive, and so safe and easy to use that it could be made available with only basic instruction. This treatment may not replace medical intervention, but promises to complement or reduce the need for traditional therapies, thereby bringing down the cost of caring for patients with diabetic eye disease. We propose that more research and development be done so that light masks (or a similar device) may be manufactured on a scale that will reduce the cost to a level reaching the masses with diabetic eye disease. It is possible that the evidence presented above concerning preventing dark adaptation in the diabetic retina, may also apply to other retinal conditions in which anti-VEGF drugs have been shown to be beneficial: Retinal diseases such as “wet” age related macular degeneration (257-265) (see chapter on age related macular degeneration (AMD) in Webvision) and retinopathy of prematurity (266) . The authors thank Carol Spencer (Lahey Hospital Library) for research support. Figures 3, 4 and 5 were kindly provided by the ocular photography department of the Moran Eye Center. Neither of the authors have any direct financial interest in any devices used in the clinical work described. 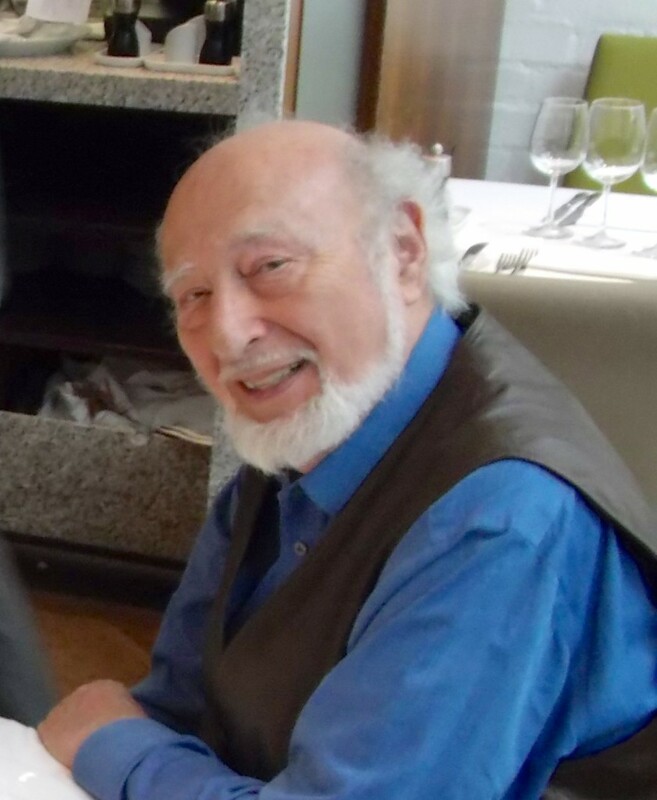 Geoffrey Arden graduated in 1951 from University College London (UCL) and joined the MRC Vision Research Unit in the newly formed Institute of Ophthalmology. He obtained a Ph.D. in photochemistry under HJA Dartnall, and returned to UCL to complete a medical degree. After studying neurophysiological techniques with Ragnar Granit in Stockholm and KT Brown in San Francisco, he returned to the Institute of Ophthalmology. In the absence of any equipment except an ECG he devised the electro-oculogram (EOG) as a clinical test and developed the first clinical electrophysiological department in the UK. He was appointed Professor, Honorary Consultant at Moorfields Eye Hospital and Director of the Electrodiagnostic department in 1968. He pioneered the use of cortical evoked potentials and the pattern ERG and devised clinical techniques for the measurement of achromatic and colour-contrast sensitivity. In an emeritus capacity he continues projects with investigators from Europe and the US and has turned his attention to the causes and treatment of diabetic retinopathy. He served a term as Chief Editor of the journal Vision Research. Dr. David J. Ramsey received his M.D. and Ph.D. degrees from the University of Illinois at Chicago in 2008. 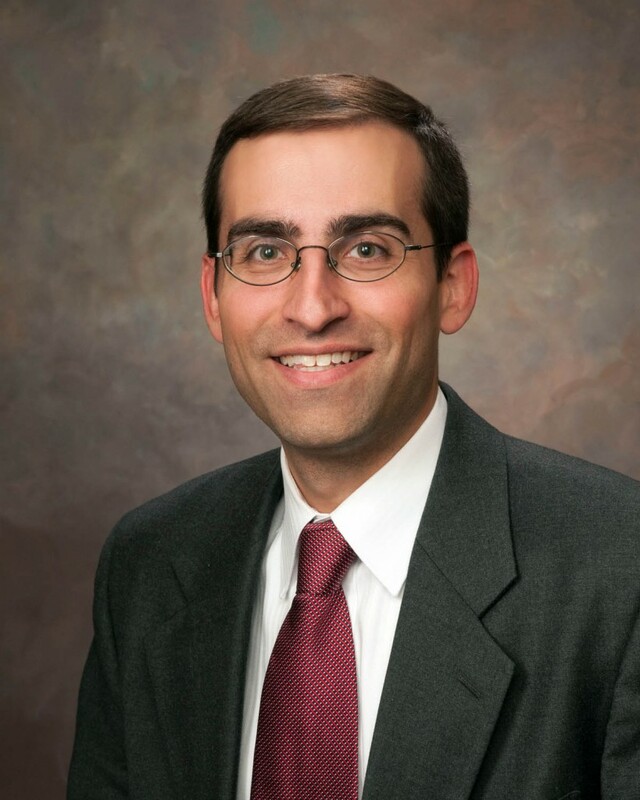 He completed his residency in Ophthalmology at the Wilmer Eye Institute of the Johns Hopkins School of Medicine in 2012 followed by a combined medical/surgery fellowship in vitreoretinal diseases at the Massachusetts Eye and Ear Infirmary in 2014. Dr. Ramsey is currently a senior staff physician at the Lahey Clinic and sees patients in Burlington, MA. He also sees patients and performs surgery in Peabody, MA. His research focuses on the prevention of dark adaptation in patients with diabetes as a means to ameliorate diabetic changes in the retina. Future clinical trials will seek to determine whether this noninvasive, environmental intervention can limit the progression of diabetic retinopathy to PDR and/or reduce levels of sight-impairing macular edema. 1: Health Topics, Noncommunicable Diseases, Diabetes. Regional Office for Europe, World Health Organization. 2: National Diabetes Statistics Report, 2014. National Center for Chronic Disease Prevention and Health Promotion, Centers for Disease Control and Prevention. 3: Facts About Diabetic Retinopathy. National Eye Institute. 7: Ramsey DJ, Sunness JS. “Pregnancy and the Mother’s Eye.” In Tasman W., Jaeger E.A., eds., Duane’s Clinical Ophthalmology, Vol. 5, Chapter 32, 2013. 17: Centers for Disease Control and Prevention. National diabetes fact sheet: national estimates and general information on diabetes and prediabetes in the United States, 2011. Atlanta, GA: U.S. Department of Health and Human Services, Centers for disease control and prevention 2011. 27: Joussen AM Gardner TW Kirchoff B and Ryan SJ ( eds) Retinal Vascular disease. Springer. 2007; p. 778. 37: Papachristodoulou D, Heath H, Kang SS. The development of retinopathy in sucrose – sucrose-fed and streptozotocin-diabetic rats. Diabetologia. 1976; 12: 367-74. 42: Albert and Jakobiec, 1994 Albert & Jakobiec’s Principles & Practice of Ophthalmology: 4-Volume Set and Website R Twerk &Co.
44: ETDRS report no. 19. Early Treatment Diabetic Retinopathy Study Research Group. Arch Ophthalmol. 1995; 113: 1144-55. 46: [No authors listed] Focal photocoagulation treatment of diabetic macular edema. Relationship of treatment effect to fluorescein angiographic and other retinal characteristics at baseline: ETDRS report no. 19. Early Treatment Diabetic Retinopathy Study Research Group. Arch Ophthalmol. 1995; 113: 1144-55. 56: Diabetic retinopathy study. Report Number 6. Design, methods, and baseline results. Report Number 7. A modification of the Airlie House classification of diabetic retinopathy. Prepared by the Diabetic Retinopathy. Invest Ophthalmol Vis Sci. 1981; 21(1 Pt 2): 1-226. 57: Early Treatment Diabetic Retinopathy Study Research Group. Grading diabetic retinopathy from stereoscopic color fundus photographs–an extension of the modified Airlie House classification. ETDRS report number 10. Ophthalmology.1991; 98(5 Suppl): 786-806. 75: Chen HX1, Gore-Langton RE, Cheson BD. Clinical trials referral resource: Current clinical trials of the anti-VEGF monoclonal antibody bevacizumab. Oncology (Williston Park). 2001; 15: 1017. 98: Grivenkova VG Vinogradov AD. Generation of superoxide by the mitochondrial Complex I. Biochem Biophys Acta 2006; 1757: 553-61. 109: Hancock JT, R. Desikan R, Neill SJ. Role of Reactive Oxygen Species in Cell Signaling Pathways. Biochemical and Biomedical Aspects of Oxidative Modification. Biochemical Society Transactions. 2001; 29: 345-350. 118: Tzekov, R. and Arden, G. B. The electroretinogram in diabetic retinopathy. Surv Ophthalmol. 1999; 44: 53-60. 203: Arden GB, Wolf JE, Collier J, Wolff C, Rosenberg M. Dark adaptation is impaired in diabetic before photopic loss can be seen. Can hypoxia contribute to diabetic retinopathy? In: Hollyfield JG (ed). Retinal Degenerative Diseases and Experimental Therapy. Plenum Press: New York, 1999, pp 305-325. 209: Warburg O. Uber die Klassifizierung tierischer Gewebe nach ihrem Stoffwechsel. Biochem Z. 1927; 184: 484–488. 210: Warburg O, Posener K, Negelein E . Uber den Stoffwechsel der Carcinomzelle Biochemedische Zeitschrift 1924; 152: 309-43. 229: Ahmed J, Hatchell DL et al. Retinal hypoxia in long-term diabetic cats. Invest Ophthalmol Vis Sci 1998; 39: 1647-1657. 231: Minot, CS. The Problem of Age, Growth and Death. The Popular Science Monthly.